Experience: Burj Al Arab Jumeirah in Dubai. The Most Luxurious Hotel in the World. Not to be mistaken with the Burj Khalifa, the tallest building in the world, the Burj Al Arab Jumeirah is not only Dubai’s most iconic building but also the most luxurious hotel in the world. Located steps away from the Jumeriah Public Beach and the Souk Madinat, the iconic white sail-shaped building hides a level of luxury accommodations and decor splendor within its walls that has no parallel. The Burj Al Arab is the only hotel in the world with seven stars and the fifth tallest hotel in the world sitting on a man-made island and connected to the Jumeriah beach by a private curving bridge. Once you embark on your journey via Emirates Business or First Class, make sure you order a negroni on your way to Dubai. Yes, the only airline we’ve flown where an actual proper negroni is served. Posted on April 3, 2019 by Editor & Publisher and filed under Watchlife, Travel and tagged Burj Al Arab Jumeirah in Dubai Luxury Hotels Burj Al Arab Dubai Burj Al Arab Jumeirah Most Luxurious Hotel in the World Vacheron Constantin Overseas Vacheron Constantin Overseas Perpetual Calendar Audemars Piguet Royal Oak ref. 15400ST Patek Philippe Aquanaut ref. 5167/1A Armin Strom Gravity Earth Burj Khalifa Dubai Museum M.A.D. Gallery Dubai Dubai Rolex Boutique Dubai Frame Souk Madinat Watchlife Royal Oak Offshore Diver Most Popular. Experience: Visiting the Audemars Piguet Manufacture in Le Brassus. A Longtime Dream Becomes a Reality. Back in 1998 I purchased my first Audemars Piguet Royal Oak, it was a stainless steel ref. 5402ST A-series that I should've never sold. After buying that first AP, the two-tone Royal Oak ref. 5402SA you see in the picture above was the one that followed. For 20 years as an AP collector and 28 years as a watch collector, I've longed visiting the Audemars Piguet manufacture in Le Brassus, Switzerland. In 2013, right around the launch of Watch Collecting Lifestyle, I was able to visit the Audemars Piguet Museum —which you can read about it here— but could come to the manufacture. Posted on June 23, 2018 by Editor & Publisher and filed under Audemars Piguet, Travel and tagged Audemars Piguet Manufacture in Le Brassus Audemars Piguet Royal Oak 5402 Most Popular 2018. Experience: Visiting the Vacheron Constantin Manufacture. An Incredible Morning at the Oldest Watch Manufacture in the World. As you all know, Vacheron Constantin is not only one of the three brands that integrate the 'Holy Trinity of Watchmaking' but also the oldest watch manufacture in the world with an uninterrupted history that spans across almost three centuries —263 years to be precise. Therefore, a visit to the Vacheron Constantin Manufacture in Plan-les-Ouates —a municipality in the outskirts of Geneva, Switzerland— is a fascinating experience that as watch collectors and scholars, we will cherish forever. Posted on February 28, 2018 by Editor & Publisher and filed under Vacheron Constantin, Travel and tagged Vacheron Constantin Manufacture Vacheron Constantin Vacheron Constantin Minute Repeater 2018 Mainstream Brands Most Popular. Experience: The Gastown Steam Clock. The World's First Steam Powered Clock and a Must See When Visiting Vancouver BC Canada. Designed and built by Canadian horologist Raymond L. Saunders and located in Vancouver BC, Canada, the Gastown Steam Clock is the world's first steam powered clock and a must see for those in love with city clocks and horology. Situated at the northeast corner of Water Street and Cambie Street, this beautiful clock whistles the Westminster chimes every quarter hour and a single whistle every hour. One of the few steam powered clocks in the world, the antique-looking Gastown Steam Clock was inaugurated only 40 years ago on September 24th, 1977. Posted on January 5, 2018 by Editor & Publisher and filed under Travel, Clocks and tagged The Gastown Steam Clock Steam Clock Clock Vancouver Canada 2018 Most Popular. Experience: Zaha Hadid's Condo at the W South Beach. A $6.5 Million Dollar Modern and Eclectic Space Like No Other. Here at WCL we are suckers for modern architecture and design and when you get to step into late Zaha Hadid's condo at the W South Beach Residences it is for sure an afternoon to remember. Considered the most prominent and successful female architect of the century, Zaha Hadid was an Iraqi-British architect who was the first woman to receive the Pritzker Architecture Prize in 2004 and the UK's Stirling Prize architectural award in 2010 and 2011. Posted on December 26, 2017 by Editor & Publisher and filed under Travel and tagged Zaha Hadid's Condo at the W South Beach Zaha Hadid Audemars Piguet Audemars Piguet Royal Oak Offshore Diver 2017 Most Popular. Experience: Louis Vuitton America's Cup World Series Chicago. A Perfect Weekend with Bremont and the Oracle Team USA. This past weekend, June 10th, 2016, the Louis Vuitton America's Cup World Series —LVACWS— a.k.a the 'Auld Mug' took place for the very first time in fresh water. The setting, Chicago's Lake Michigan lakefront and Navy Pier. Since Bremont is the timing partner for the America's Cup and one of the partners for the Oracle Team USA —the defending champion—, we were invited as one of their special guests. The Louis Vuitton America's Cup is a trophy awarded to the winner of the America's Cup match races between two sailing yachts. Posted on June 15, 2016 by Editor & Publisher and filed under Bremont, Travel, Events and tagged Bremont Louis Vuitton America's Cup America's Cup Most Popular. Experience: Visiting the Jaeger-LeCoultre Manufacture in Le Sentier, Switzerland. A Once in a Lifetime Watch Experience. Visiting the Jaeger-LeCoultre Manufacture is one of those things that every watchlifestyler should do at least once in their lifetime. Jaeger-LeCoultre is one of the most legendary watch brands with a very rich history that dates back to 1833, when in the remote mountains of Jura, inventor Antoine LeCoultre revolutionized the art of horology and turned the Vallée de Joux into the cradle of fine Swiss watchmaking. Posted on February 10, 2016 by Editor & Publisher and filed under Travel, Jaeger-LeCoultre and tagged Jaeger-LeCoultre JLC Manufacture JLC Most Popular. Experience: The Patek Philippe Museum. The Most Amazing Horological Museum in the World. The Patek Philippe Museum is a must see for any watchlifestyler. Located in the heart of Geneva on Rue des Vieux-Grenadiers 7, this museum holds the largest collection of horological pieces and the most fascinating horological exhibit in the world. The Patek Philippe Museum holds more than 2,200 timepieces within their collection divided in two segments, the antique collection dating from 1500-1850 and the Patek Philippe collection that includes not only almost every single reference ever released by Patek Philippe —including commemorative pieces from their various anniversaries as well as unique pieces— but also some of the impressive Henry Graves Jr.'s timepieces, the Supercomplication 'Duke of Regla', the Calibre 89 and a special exhibit with all the pieces commemorating the 175th anniversary amongst others. Once you make yourself into the museum an air of grandeur fills every corner. Posted on March 12, 2015 by Editor & Publisher and filed under Patek Philippe, Travel and tagged Patek Philippe Museum Henry Graves Jr. Minute Repeater Patek Philippe Duke of Regla Calatrava Patek Philippe Calibre 89 Patek Philippe Star Calibre 2000 Top Travel. 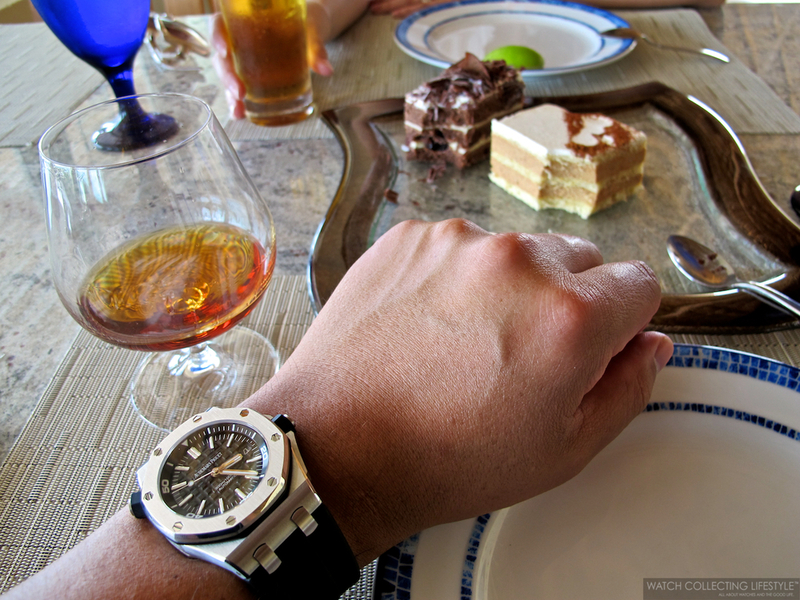 Experience: Audemars Piguet Royal Oak Offshore Diver in the Cayman Islands. A Perfect Companion. We just returned from the Cayman Islands after a wonderful week at the Ritz-Carlton. We did plenty of water activities including interacting with stingrays, smoking a handful of Habanos —Montecristo #4— and trying on several Audemars Piguet watches at Grand Cayman's authorized dealer Magnum Jewelers. At Magnum, we perused the new Royal Oak Offshore line in 44mm, the Offshore Legacy, a Jumbo ref. 15202 and a ref. 15400, amongst others. Great friendly service by the way. Posted on October 18, 2014 by Editor & Publisher and filed under Travel and tagged Audemars Piguet Offshore Diver Royal Oak Offshore Ritz Carlton Grand Cayman Magnum Jewelers 2014. Experience: Grand Velas Riviera Maya. Vilebrequin Trunks and Watches are All You'll Need to Bring. Memorial Day weekend officially marks the beginning of Summer for most watchlifestylers and watch collectors in the U.S., this time we are once again featuring the luxurious Grand Velas Resort in Riviera Maya, which happens to be one of our favorite destinations in that part of the world. Riviera Maya is a tourism paradise located in the eastern side of the Yucatan Peninsula in Mexico. This secluded beach destination is only 25 miles south of Cancun and 5 miles away from Playa del Carmen. Grand Velas is a paradisiac oasis where luxury, fine dining and relaxation are the common denominators. Pack your Vilebrequin trunks and your watches and get ready to experience service at its finest. Posted on May 25, 2014 by Editor & Publisher and filed under Travel and tagged Grand Velas Riviera Maya Resort Audemars Piguet Royal Oak Offshore Safari Most Popular. Experience: MB&F's M.A.D Gallery. 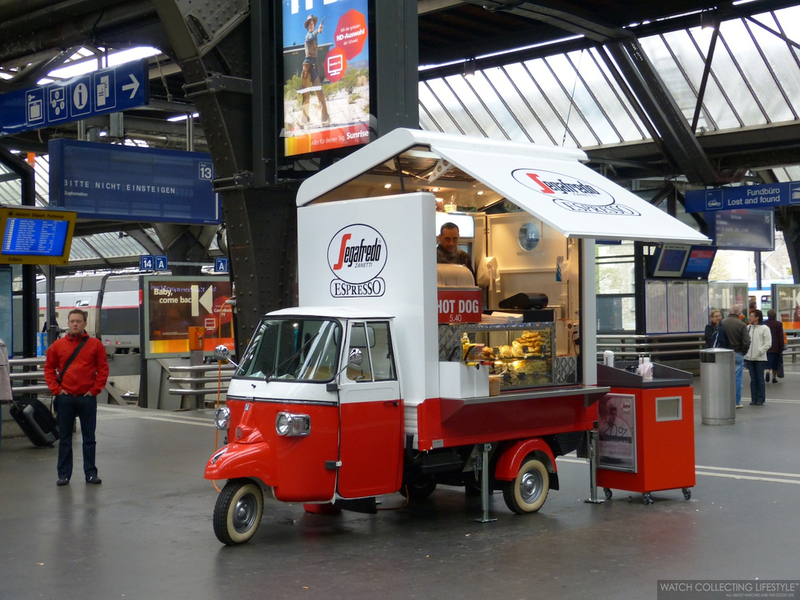 A Must See When You are Visiting Geneva. 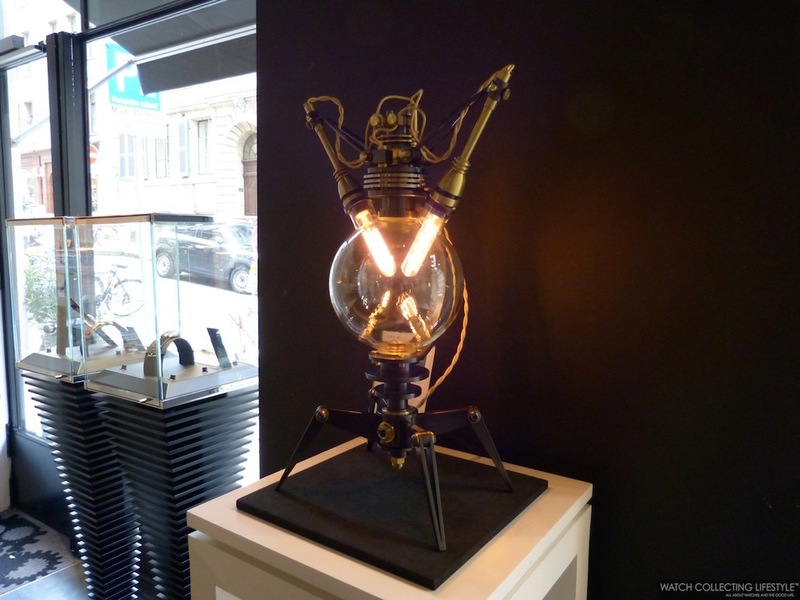 Next time you are visiting Geneva, you need to make sure you stop by MB&F's M.A.D —Mechanical Art Devices— Gallery. 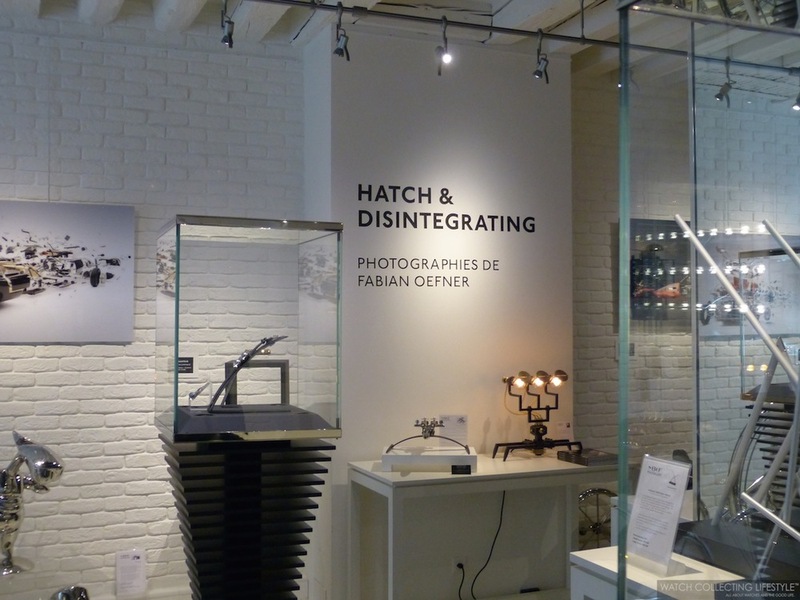 This fascinating cozy and intimate gallery is not only the office to some of the team members from MB&F, but also an interesting place where horology and mechanical objects blend into one. Xia Hang, sculptor from Beijing, China and the main source of inspiration for the new MB&F Legacy Machine N°1 Xia Hang reviewed here. Here are some of the sculptures we saw while we were there. The sculptures are meant to be touched and play with as a link between the artist and the visitor. Fabian Oefner a Swiss artist is presenting his 'Hatch & Disintegrating' breathtaking photographs that we featured here back in December of 2013. 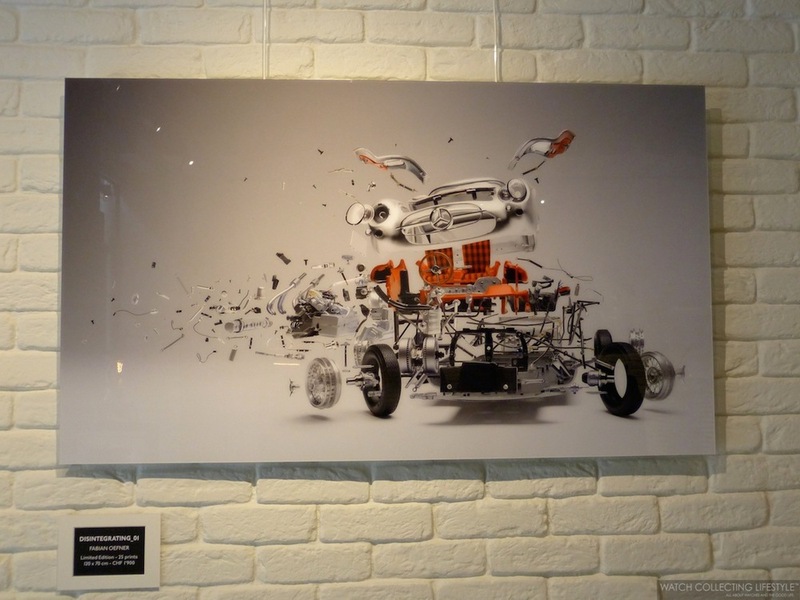 The three images of the Disintegrating series are exploded views of classic sports cars that Fabian has painstakingly created by deconstructing vintage roadster scale-models, photographing each component, piece by piece in a very specific position, to create the illusion of an exploding automobile. 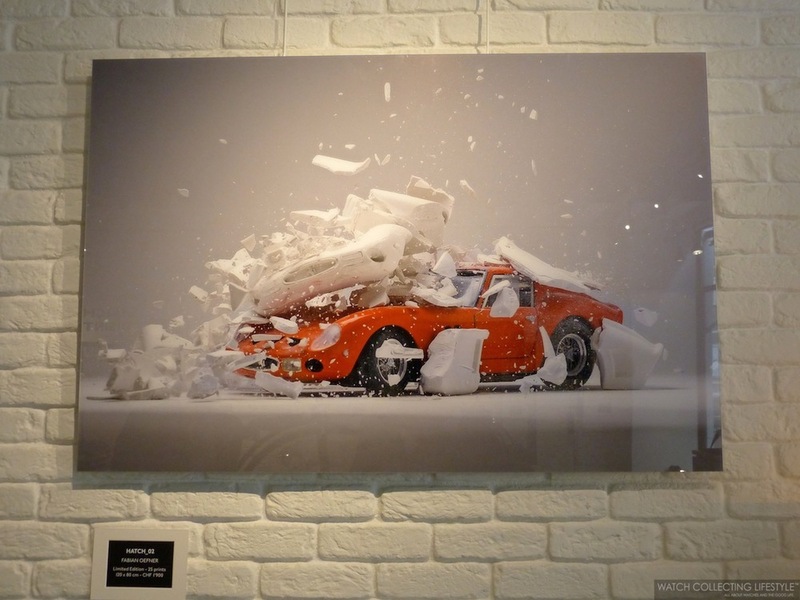 The images show exploded views of classic sports cars: intricate scale models of an eye-wateringly beautiful Mercedes-Benz 300 SLR Uhlenhaut Coupé with gullwing doors from 1954; an iconic sleek, black Jaguar E-Type from 1961; and a curvaceous sensual Ferrari 330 P4 from 1967. Quentin Carnaille a French architect converted into an artist to explore time’s mysteries. The young artist develops an increasingly thorough reflection around the notion of time, questioning themes like infinity or relativity with the use of mirrors, magnets and mechanical watch movement parts. He is the creator of the 'Apesanteur' and the 'Infini' sculptures. The 'Apasanteur' —which can be translated as ‘Zero Gravity’ or ‘Weightlessness’—is a sculpture fitted with a levitating disk composed of thousands of mechanical watch components and suspended in air thanks to the powerful magnetic field of a magnet hidden inside the wooden base of the sculpture. ‘Apesanteur’ is an invisible link between astronomy and mechanical watchmaking in a limited edition of 12 pieces priced at around $15,000 USD. ‘Infini’ —Infinity— is made of 16 watch sculptures also composed of thousands of vintage micro-horological components that are magnetically stuck to one another. 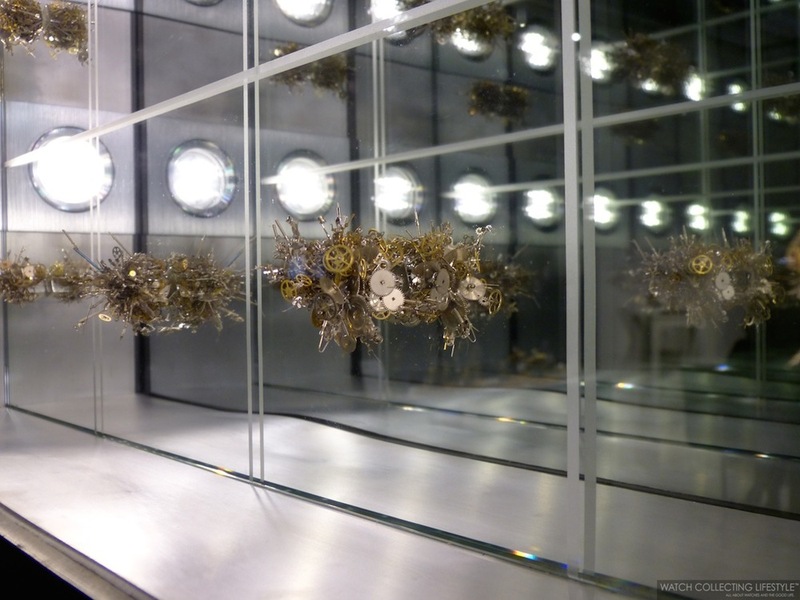 They float in an endless picture, part light fixture, part sculpture and part mirror. There, time and infinity coexist in a stunning work. 'Infini' is available in a limited edition of 12 pieces and priced around $21,500 USD. Lastly, Berlin-based Frank Buchwald who worked as a freelance artist and science-fiction illustrator until 1993 when he turned his attention to designing and manufacturing metallic furniture. He created all manner of metal furniture until about a decade ago when he started to focus his efforts on making lamps. It took Frank many years before he felt that the designs of his sculptural lights were moving in the right direction, and an even longer time until he could say he was completely satisfied. His work titled 'Machine Lights' is literally a combination of industrial machines and lights to create captivating light fixtures and lamps that are priced between $10,900 and $27,500 USD. 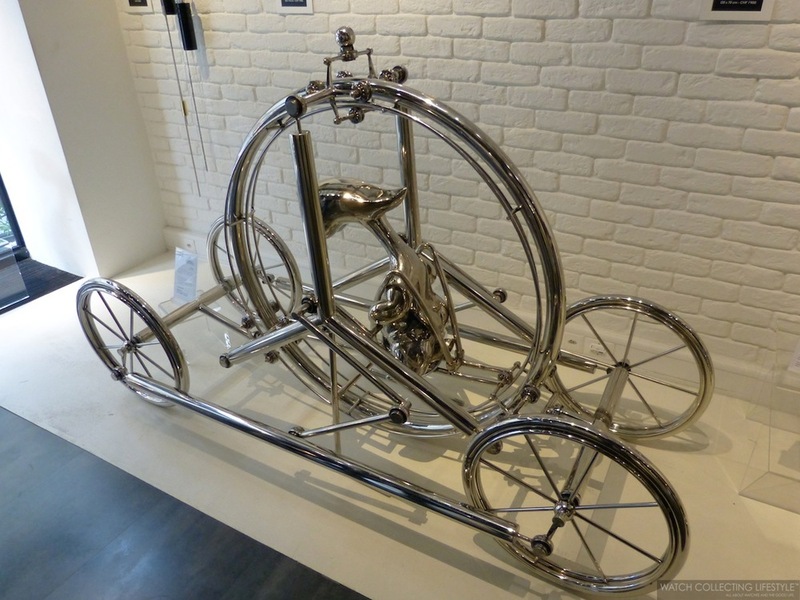 At the gallery, you will also find other interesting objects and works from artists like Japanese artist Chicara Nagata whom for the past 20 years, has been dedicating his entire energy to the creation of art pieces, most commonly known as motorcycles. His motorcycles called Chicara Art I, II, III, IV and V cost approximately $407,000 USD each and Chicara Nagata became the World Champion of Custom Bike design in the Freestyle category when he presented the Chicara Art I in 2006. Oh and if you were wondering if any MB&F machines are on display at the gallery, the answer is yes. 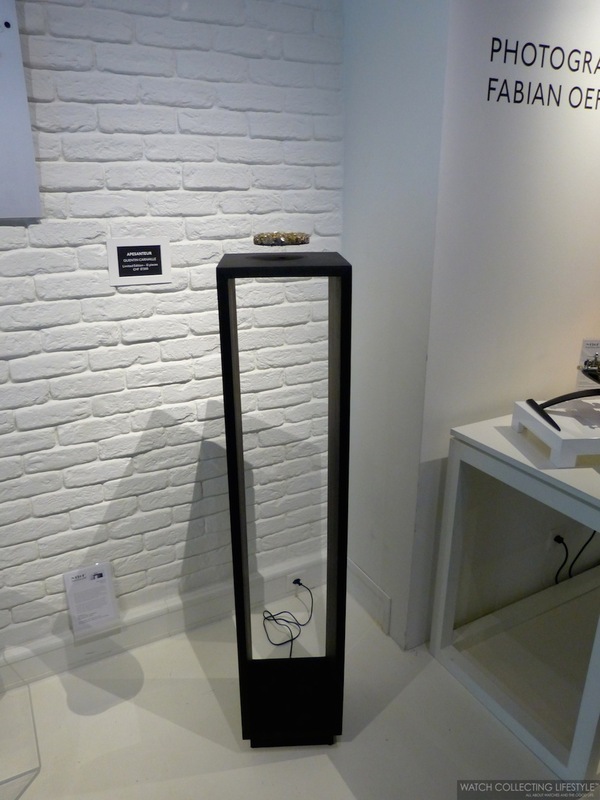 The M.A.D Gallery is located on Rue Verdaine 11 in Geneva, Switzerland. For more info on MB&F's M.A.D Gallery click here. Posted on March 23, 2014 by Editor & Publisher and filed under Travel, MB&F and tagged MB&F M.A.D Gallery Chicara Nagata Xia Hang Frank Buchwald Fabian Oefner Quentin Carnaille. Experience: London's Andaz Liverpool Street Hotel. Just as Exceptional as the Girard-Perregaux 1966 Platinum on the Wrist. The Andaz Liverpool Street Hotel in London is one of the original London railway hotels, formerly opened as the Great Eastern Hotel and housed in a beautiful red brick Victorian building dating back to 1884 right behind the Liverpool train station and a couple blocks away from iconic Gherkin building. The Andaz is the perfect hotel to help you overcome your jet lag after a long transatlantic flight and welcome you with a perfectly nested and nicely stocked watch boutique —Carr Watches— right next door. Once inside the hotel, you will be pleasantly surprised by its ultra modern and minimalist decor that is the common denominator in boutique hotels like this. 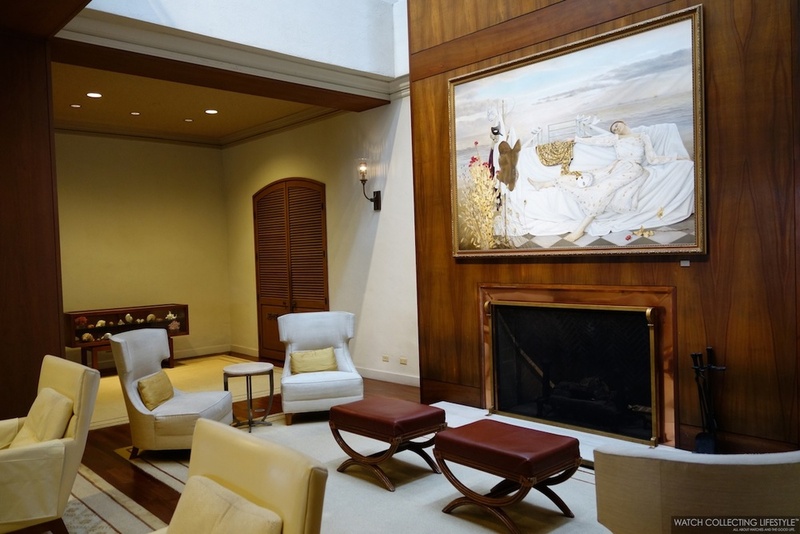 As you walk in, you will realize there's no check-in desk so just go ahead and make yourself comfortable in one of their elegant leather chairs or chaise lounges. Within seconds, someone from their friendly staff will come greet you, ask you if you need any water and check you in without any hassles. As you take a deep breath, you'll sense the beautiful scents from their candles that are perfectly placed around the lobby area and that make the space super cozy and intimate. Before heading upstairs to your room, make sure you stop by their intimate coffee lounge —right before the lifts— to get some well needed caffeine from their perfectly calibrated Nespresso machines or perhaps a cup of English tea or maybe just some pear elderflower refreshing soda. Now, if you have a sweet tooth and you like to have your coffee or tea with some shortbread biscuits, just help yourself to the canisters on top of the wooden block table filled with delicate and freshly baked goodies, all at your fingertips. As you head upstairs to your room, you can't stop thinking about the beautiful watches you saw at Carr Watches as you were walking into the hotel. As you walk into one of their beautiful modern rooms and you sit down on the inviting red chair in the corner of the room to do the first watch change, you realize you shouldn't be in the room too long as you want to head downstairs and make sure you take a closer look at the amazing Audemars Piguet Royal Oak Offshore End of Days you saw upon arrival. The last thing you want, is for another watchlifestyler to get there before you do and buy it. As you head out of your room, you spend some time checking out the space and the tasteful architecture inside the hotel. For some reason, the circular opening across from the lifts reminds you of the Guggenheim as you look downstairs. After snapping a few pictures you are finally back in the lobby to go do some watch shopping. After a nice visit at Carr Watches —featured here—, you walk all the way to the London Bridge with your mind full of ideas on what to buy next and see if you can make a decision the next morning. Honestly, you just flew across the globe and you still have a full day of watch shopping in London —one of the watch shopping capitals of the world as we published it here— before you end up making an impulse buy. As you walk back into the hotel you are starving; therefore, you decide to check one of their seven restaurants and bars to choose from. You can savor some afternoon tea and British fine dining in London's highly-reviewed 1901 Restaurant & Wine Bar; have some authentic Japanese cuisine in Miyako; a brasserie grill menu in Eastway; traditional English pub fare in George or for the perfect place to meet, relax or party the night away, the new Catch Champagne Bar & Lounge. Since it's your first night, you want to take it easy and you head to Catch Champagne Bar & Lounge where you can have a little bit of everything while sipping a few glasses of your favorite Laurent Perrier Rose champagne. Pleasantly satisfied with your meal, you feel you're not ready for bed yet and you decide to have a nightcap drink at their pub named George. Since the name of the pub reminds you of a very dear 'drinking friend' from New York City, you decide to have a few Bombardiers and even a Symonds cider. Now, you are perfectly relaxed and ready for bed. As you head upstairs to dream about watches and peacefully rest in your comfy bed, you realize you might not even be able to fall asleep thinking of all the watches you'll see the next day on Old Bond Street and New Bond Street. Sweet watch dreams! 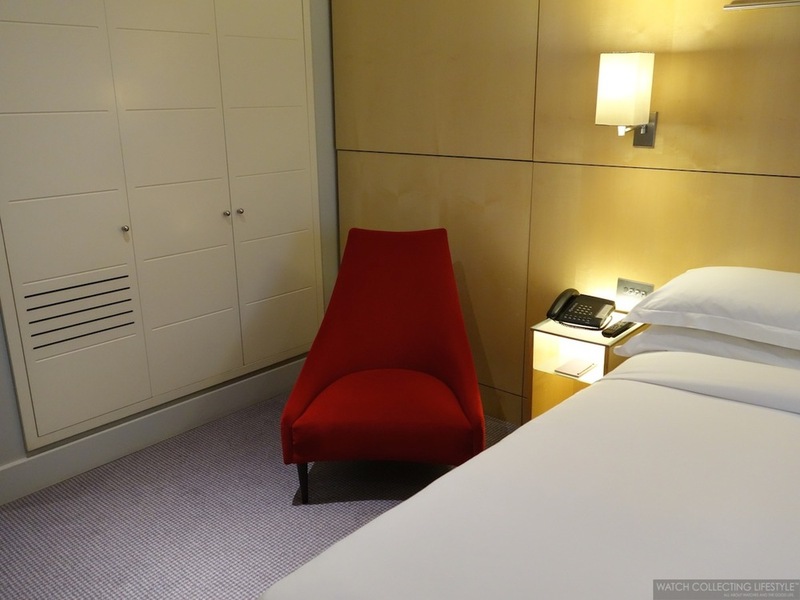 For more info on Andaz Liverpool Street Hotel click here. Posted on March 15, 2014 by Editor & Publisher and filed under Travel and tagged Andaz Liverpool Street Hotel Gherkin Building London. Experience: The Halekulani Hotel in Honolulu, Hawaii. 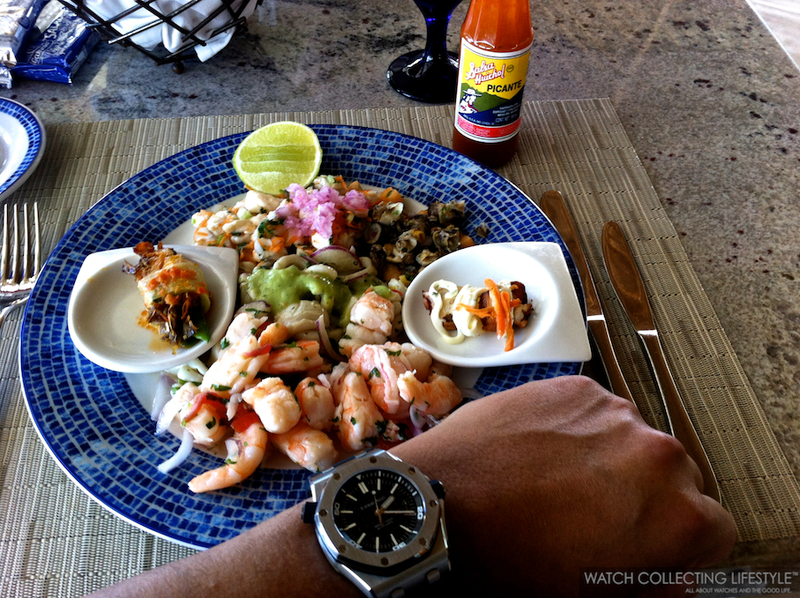 Service, Luxury and Hospitality with a Rolex GMT Master II on the Wrist. If service, luxury and hospitality are the three words that come to mind when thinking on where to stay on your next Hawaiian getaway, then be sure to tell Platinum Concierge at American Express to book you at the Halekulani Hotel on O’ahu as soon as possible. Old world hospitality and remember-your-name service is alive and well at this classic hotel located on the sands of Waikiki Beach. The entire lobby area and first floor have no doors as this hotel always wants to maintain an air of openness and hospitality. As large as this hotel actually is, you would never know it; the lobby area is quaint and inviting. A beautiful floral arrangement is the centerpiece of the lobby and is the first thing one sees upon walking toward check-in. While being escorted to the room, one cannot help but be delighted by the cordial welcoming by any staff member you see along the way to your room. "Aloha" —hello in Hawaiian— is the thing to say and definitely the spirit of this hotel. 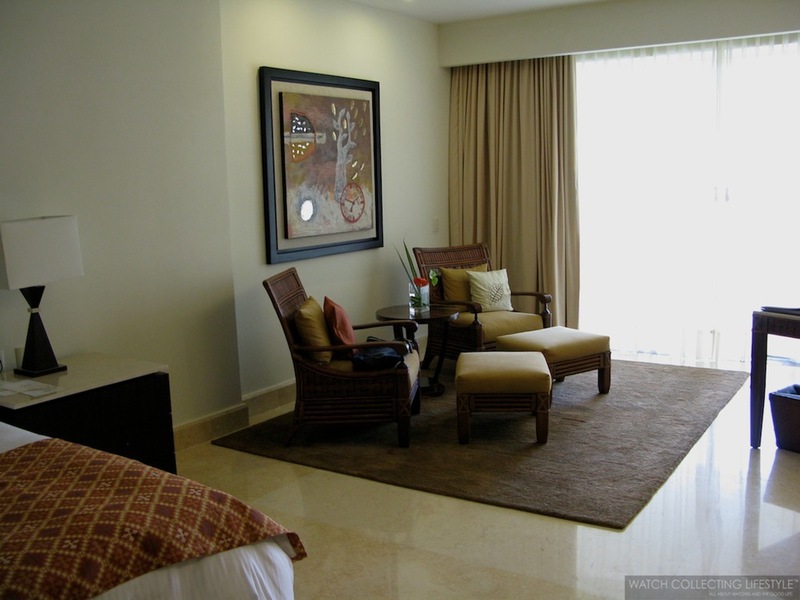 The rooms, while not the biggest for a luxury hotel, are simple and elegantly furnished. Light blues and whites are used throughout to keep a very bright and tidy look. Not much is used in the room in terms of electronics or gadgetry but the WiFi is complimentary and very fast. At the end of day you are in Hawaii to relax and enjoy nature and the ocean. As you rest on your personal lawn chair on the lana’i —or balcony in plain English—, the views of Waikiki Beach and Mamala Bay are spectacular. The cool breeze from the Hawaiian trade winds are as refreshing as they are invigorating. Enjoying a cold beverage with this view beats any time spent at any of the nearby bars or restaurants. The sun is setting and the beaches start to clear...it must be time to get ready to explore the city. You reach into the in-room safe and pull out your Rolex GMT Master II to complete your evening look. With the ability to keep three time zones at once, this watch is a 'must-have' for watchlifestylers who constantly need to juggle time zones of loved ones as well as business matters. Choosing the stainless steel model will keep you under the radar, while the polished center links of the beautiful Oyster bracelet will give that subtle 'pop' to your wrist that the popular Rolex Submariner in stainless steel won't. 5:30 P.M. rolls around so you make your way to the elevator. Once in the lobby, you hear the sweet sounds of traditional Hawaiian music. Your ears try to guide you to the sound, and sure enough you find a trio playing music at the 'House Without A Key', a bar located to the right of the pool. Before leaving the grounds, this is the perfect place to get your first drink of the evening. With an extensive list of cocktails both traditional and tropical, one can easily find something to quench their thirst. Being that this is Waikiki, your choices for eating and drinking are plentiful. 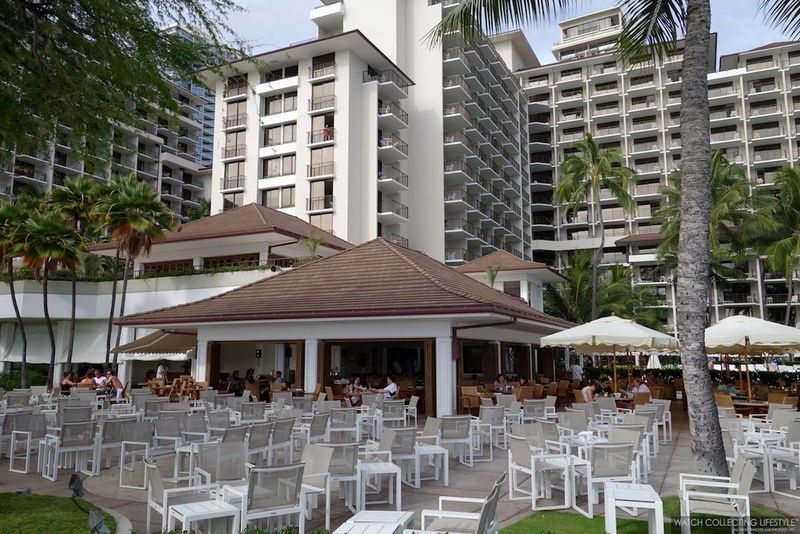 Our suggestion, is to head down to the Trump International Hotel Waikiki, located on the corner of Saratoga Road and Kalia Road just steps from the Halekulani Hotel. At the bar located on the fifth floor called 'Wai’olu Ocean View Lounge', you can try their award winning Mai Tai —yes, it’s won Hawaii’s Best Mai Tai for many years in a row— or just a plain and simple Chopin vodka water. With views of both the ocean and the buildings in and around downtown Honolulu, it is a spectacular place to watch the sunset as well as fireworks on Friday nights. Had your fill here? Head downstairs to BLT Steak on the first floor. You won’t find any contrived tropical nonsense here. This is where you come for steak and fine seafood while avoiding the crowds and the typical tourist meal. Your evening winds down... luckily the haven of tranquility and relaxation that is the Halekulani Hotel is only steps away from dinner. If you need that last night cap before retiring to your chambers, I recommend 'Lewers Lounge' at the hotel. While a jacket is not required, pants and shoes are, therefore, make sure you are properly attired. 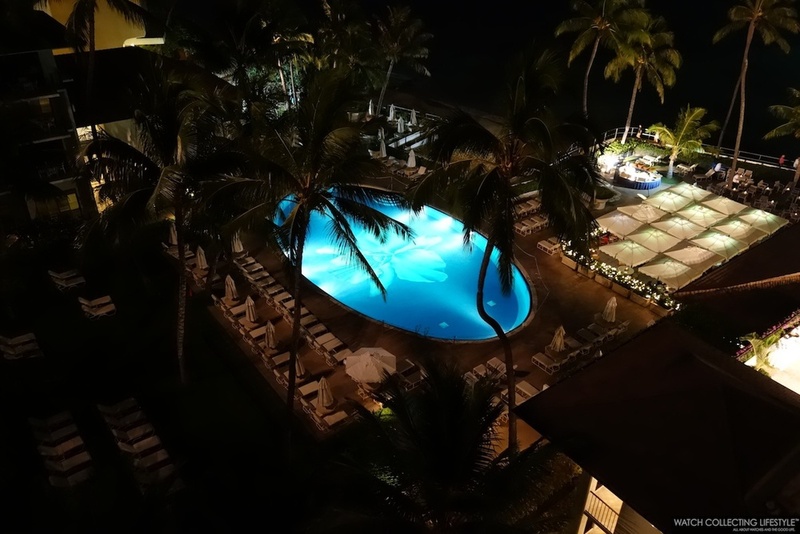 Sweet jazz plays until midnight on most nights —some nights later— and their coconut cake at the Halekulani is famous to travelers and locals alike. 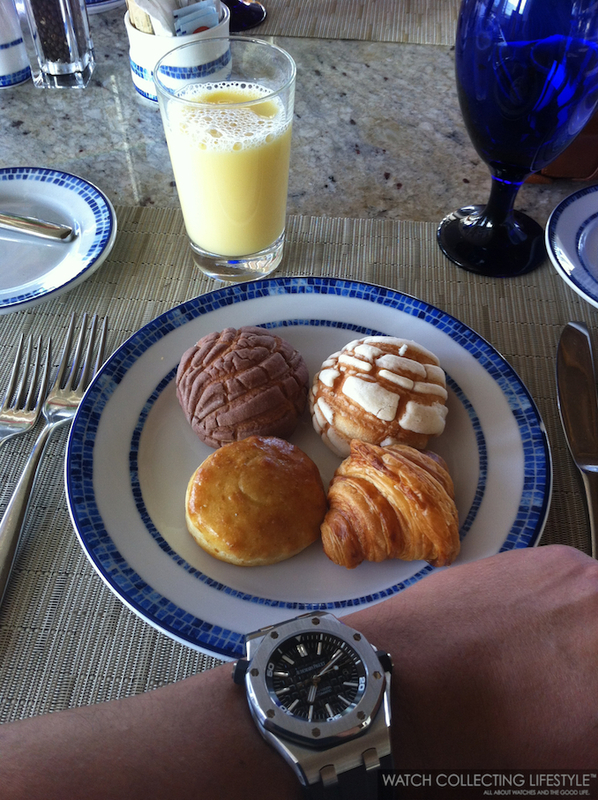 This watchlifestyler opts for a half bottle of something French and a slice of cake...it is vacation after all. Your night has come to a close. You enter your room to find that the sheets have been turned down. You enter a deep slumber, looking forward to a wonderful day of sunshine and drinks by the pool the following day. 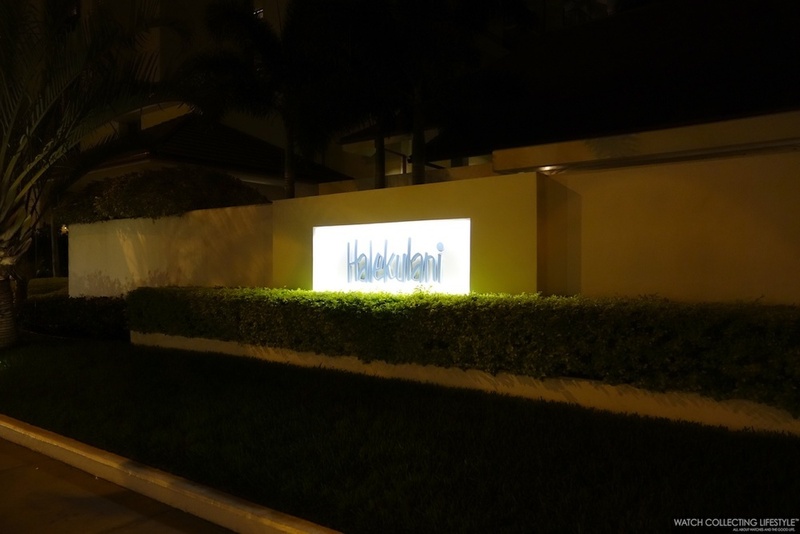 For more info on the Halekulani Hotel click here. 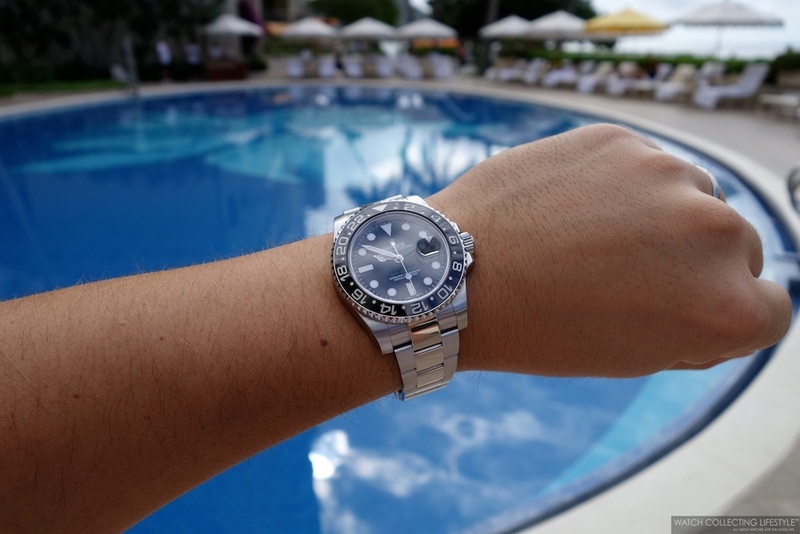 Posted on February 23, 2014 by Editor & Publisher and filed under Travel and tagged Halekulani Hotel Lewers Lounge Rolex GMT Master II Wai’olu Ocean View Lounge Waikiki Beach Mamala Bay. 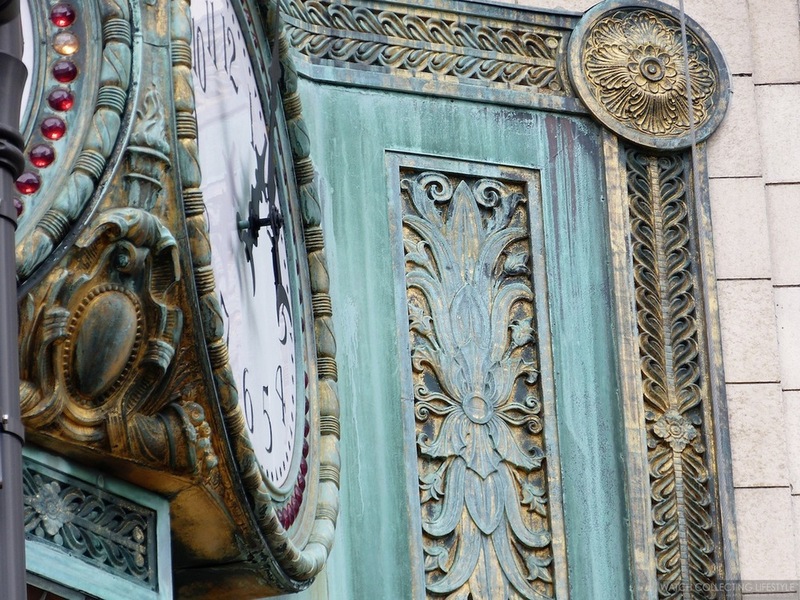 Experience: Chicago's Father Time Clock at The Jewelers' Building. A Chicago Icon and a Gift by Elgin Watch Company in 1926. 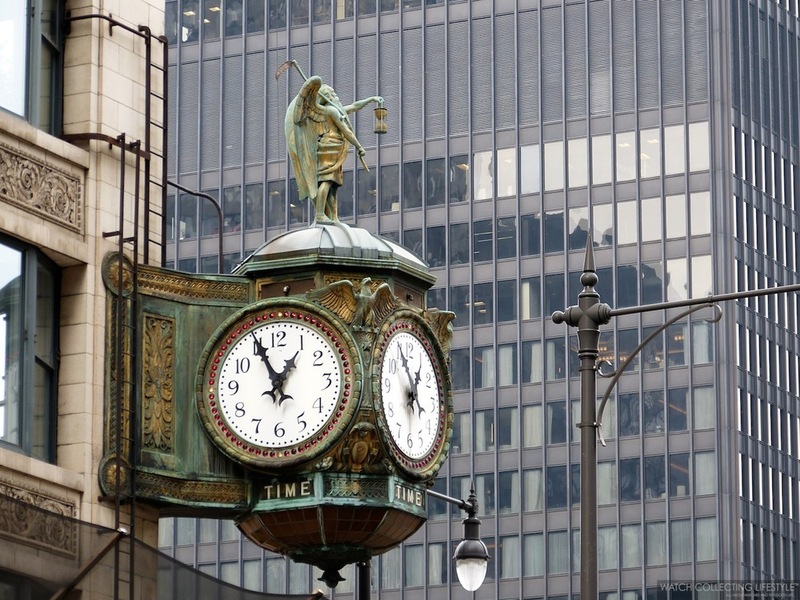 Dating circa 1926, the Father Time clock situated at the Northeast corner of the iconic Jewelers' Building in Chicago —35 East Wacker Drive— is without a doubt, the most beautiful clock in the Windy City. The Jewelers' Building is a 40-story historic landmark facing the Chicago river. The building was completed in 1926 and it was once considered the tallest building in the world located outside of New York City. 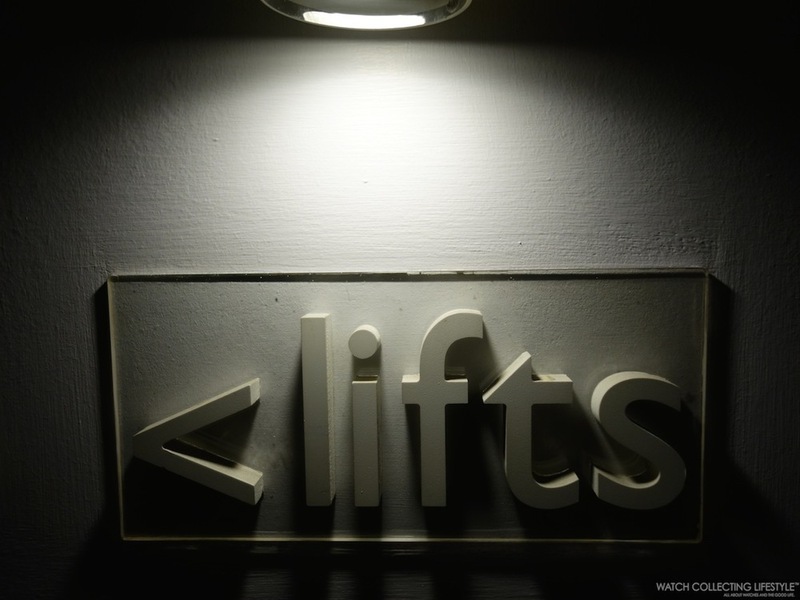 The building was originally conceived for the city’s diamond merchants and fitted with a central car elevator that could lift cars as high as the 22nd floor in order to reduce the chances that its tenants would be mugged walking between their cars and their offices. 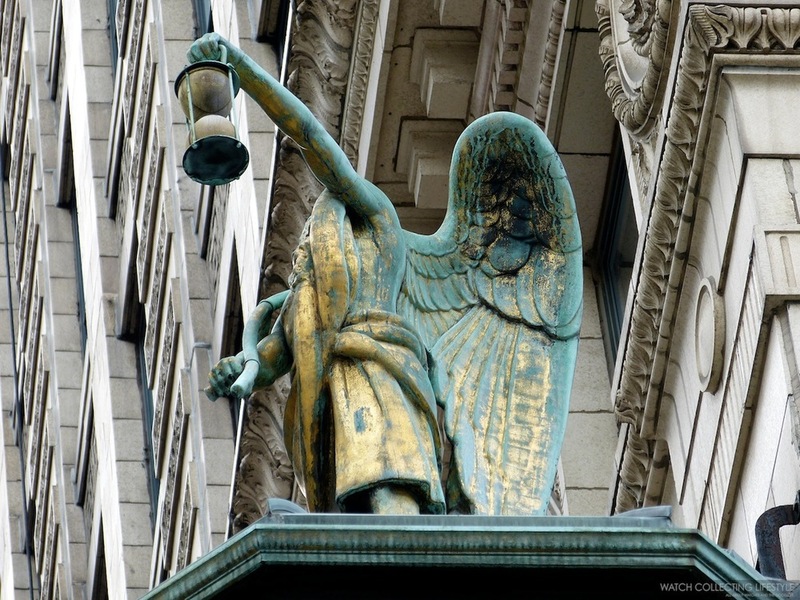 According to the Smithsonian American Art Museum's Inventories of American Painting and Sculpture database, the bronze base of the Father Time clock weighs eight tons and it was a gift presented by the Illinois based Elgin Watch Company to the Chicago Jeweler's Association. 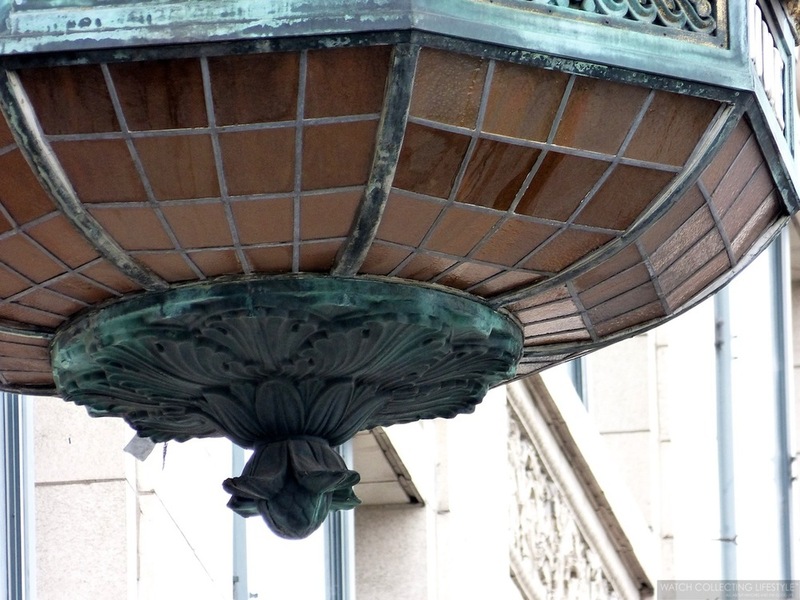 The octagonal domed top of this iconic clock is topped with a five feet tall sculpture of Father Time. This character was the symbol for the Elgin Watch Company which, at the time of the building's completion in 1926, had general offices in the building. While the Father Time sculpture on the clock is somewhat different to the actual logo used by the Elgin Watch Company, it's been confirmed by historians, that the logo was indeed the inspiration for the sculpture on top of this magnificent clock. Father Time is usually depicted as an elderly bearded man, dressed in a robe and carrying a scythe and an hourglass —which represents time's constant one-way movement. This character derives from the Grim Reaper and Chronos the Greek God of Time. It is also known that a number of copies of this winged sculpture were produced by the same unknown artist; however, nobody really knows where these could be located. This magnificent clock is composed of four white dials —each of them approximately five feet in diameter— with black Arabic numerals, black adorned hands and black minute markers. Each dial is fitted with a bezel with fifty-six red lights and four amber lights that light up after dusk. The top of the structure where the sculpture of Father Time stands, is intricately adorned with three bald eagles —each eagle is located between the top of two dials— and at the base of the clock structure, right underneath each dial, we find the word 'Time'. The word 'Time' just like the lights on the bezel, lights up after dusk. 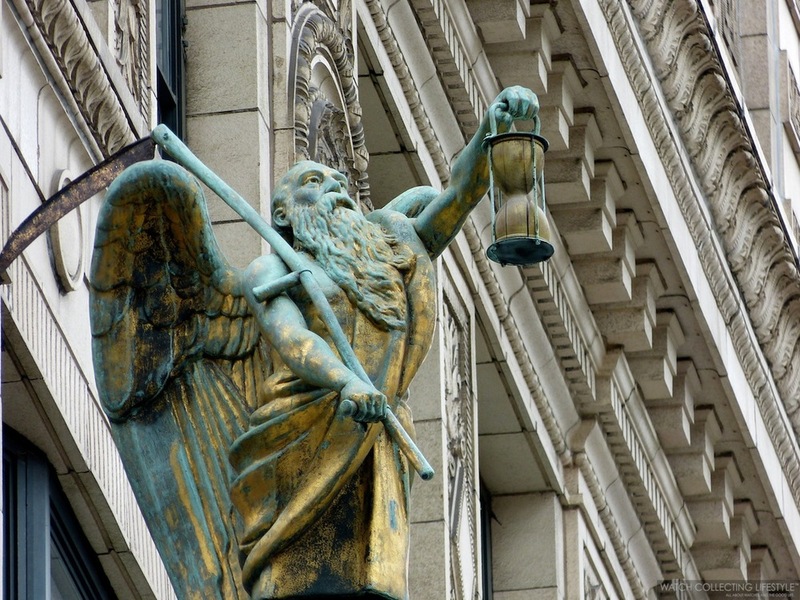 Next time you are walking around the streets of Chicago make sure you pay a visit to the iconic Father Time clock and make a wish. Remember "the clock of life is only wound once and nobody knows when it will stop". The estimated value of this clock remains unknown; however, to us, it is just 'priceless'. Lastly, enjoy a picture of the famous Jewelers' Building in its full splendor. 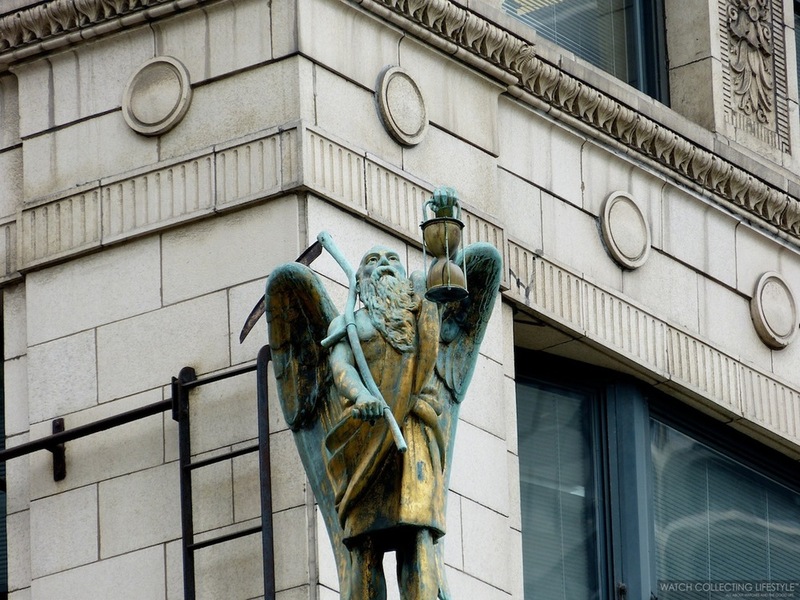 Posted on November 15, 2013 by Editor & Publisher and filed under Travel and tagged Jewelers' Building Chicago Father Time Clock on 35 East Wacker Father Time Clock Chicago. 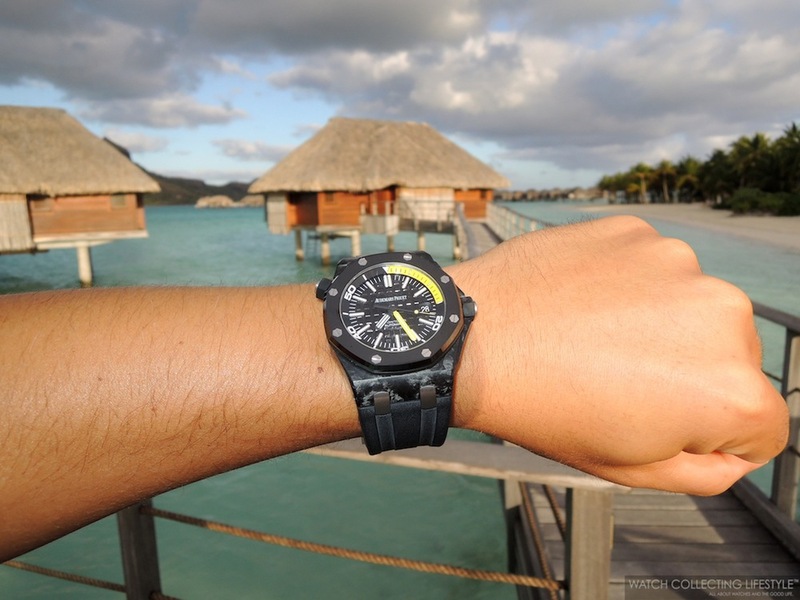 Experience: Four Seasons Resort Bora Bora with an Audemars Piguet Royal Oak Offshore Forged Carbon Diver. 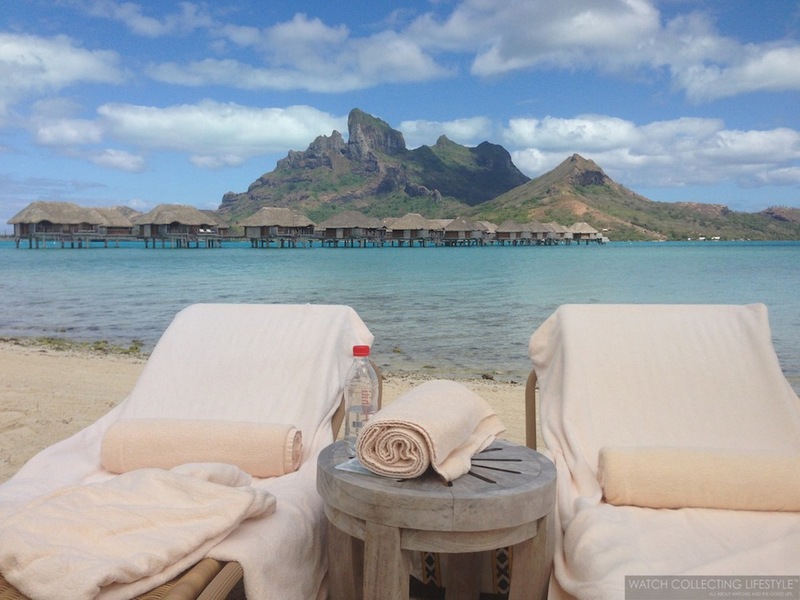 For the watchlifestyler craving an island hideaway, we invite you to experience this wonderful trip to the Four Seasons Resort Bora Bora with us. Adventure, luxury, and the warmth of the Polynesian people await you. 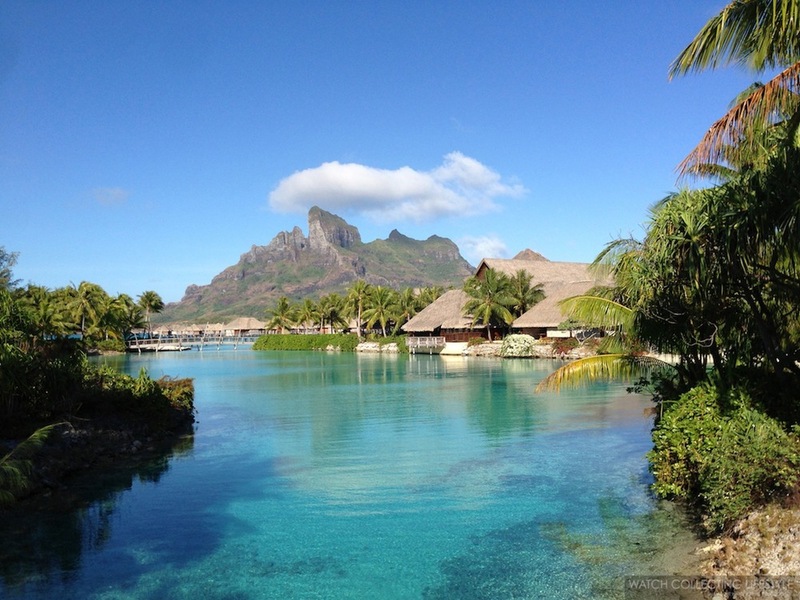 Getting to Tahiti requires an 8-hour flight from LAX via Air Tahiti Nui in an exceptionally clean and tidy aircraft with turquoise blue accents, reminiscent of the waters that you will soon encounter and that await you. With world-class service in both Business and Economy class, the journey across the Pacific is a peaceful and easy one. After a long, restful sleep in your duvet in the comfort of Air Tahiti Nui’s Business Class, you will awake on the island of Tahiti. From there, a short 40-minute flight will transport you to Bora Bora, the beautiful and often photographed piece of heaven located in the middle of the South Pacific. 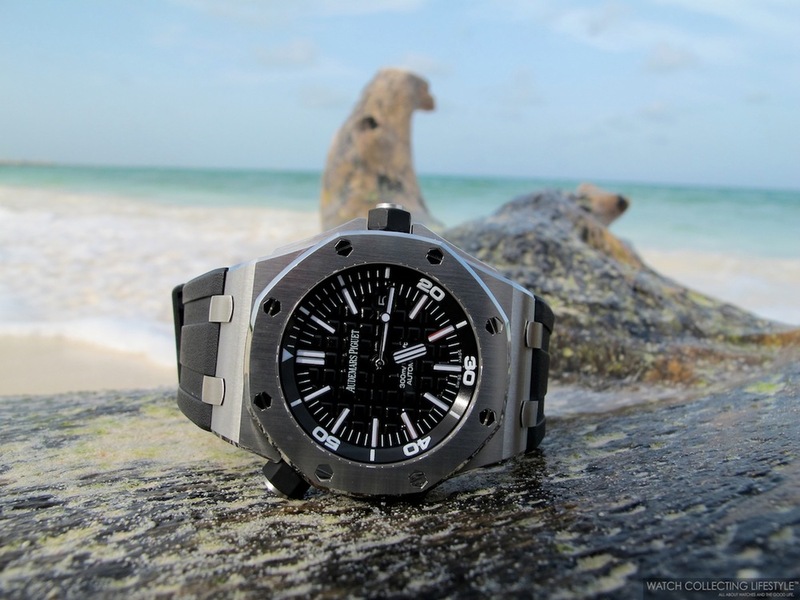 The perfect companion for a trip like this is an Audemars Piguet Royal Oak Offshore Forged Carbon Diver. Upon arriving at the airport in Bora Bora, which is located on one of the many small islands known as “Motu” in Tahiti, you are welcomed by the staff from the Four Seasons right at the baggage claim area. Although the crystal clear and turquoise water mesmerizes you, you can’t help but notice the charm of the Four Seasons private vessel that will take you to the resort. Once aboard, a Tiare —a Tahitian Gardenia— scented moistened towel and refreshments welcome you as you enjoy a 20-minute boat ride to the hotel. Upon check in, you are greeted with a small mango smoothie and a warm “la Orana” which is “Hello” in the Tahitian language. You are then driven in a golf cart to your private bungalow. The Four Seasons Resort Bora Bora is a hotel comprised of 100 private bungalows. These picturesque, over-the-water huts —1,100 sq. ft.— that are often seen on postcards and travel magazines are just amazing. 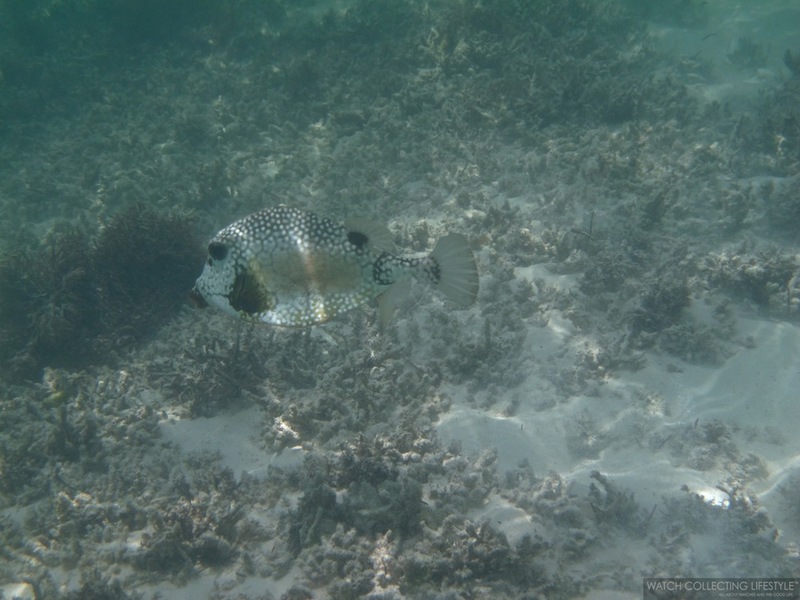 The property itself has its own mini lagoons and inlets which are full of sea life and a perfect snorkeling option for those that don't want to go into the open waters. Each bungalow features a living room, a central bathroom and a bedroom all separated by sliding doors. 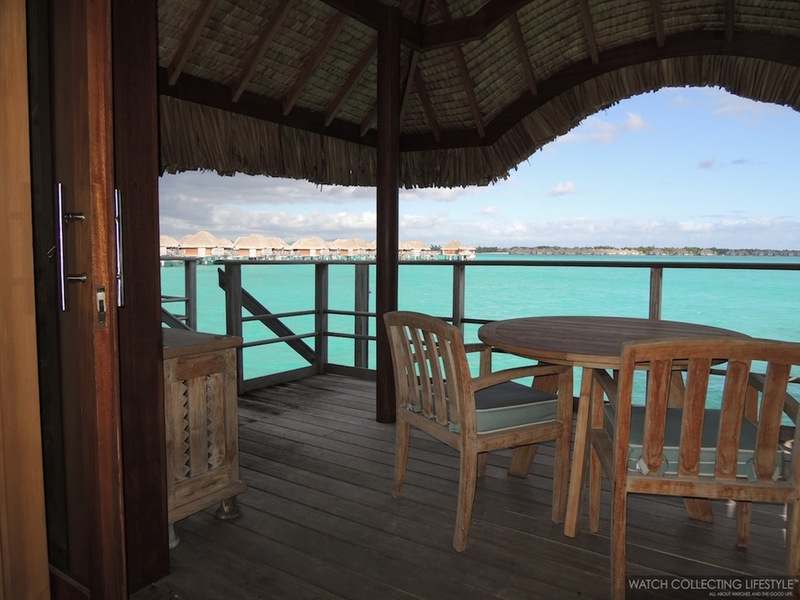 The outdoor deck has a dining area and each bungalow has a private dock and sunbathing space. With private amenities like these, you may never have to find your way to the beautiful infinity pool or the white sand beach. All you have to do is change into your Vilebrequins —or wear nothing at all— and take a plunge off of your private dock into the crystal clear and warm waters of Bora Bora to wash the jet-lag right off. If you aren’t up to jumping into the ocean quite yet, open up the sliding doors to the deck from your bathtub and enjoy the view as you soak with the French bubbles you found waiting for your arrival in the living room. You forget the real world as the cool breeze of the tropics refreshes and nourishes your soul. As you enjoy magnificent views of Mount Otemanu in the distance, you can’t help but to find yourself saying: “La vie est belle!” out loud as you drift into the South Pacific daydreams. In the bathroom, you will find glass-covered cut-outs that showcase the crystal clear waters below your bungalow. These are exceptionally fun to look at in the evening when the lights below the bungalows make the water glow. The vanities and shower are stocked with L’Occitane amenities so you are as fresh as the Pacific trade winds that cool you down. Each bungalow also has a beach bag and two pairs of beach sandals, yours to keep and take home with you as a keepsake from the piece of Heaven you enjoyed. The resort grounds feature four places to eat and drink. 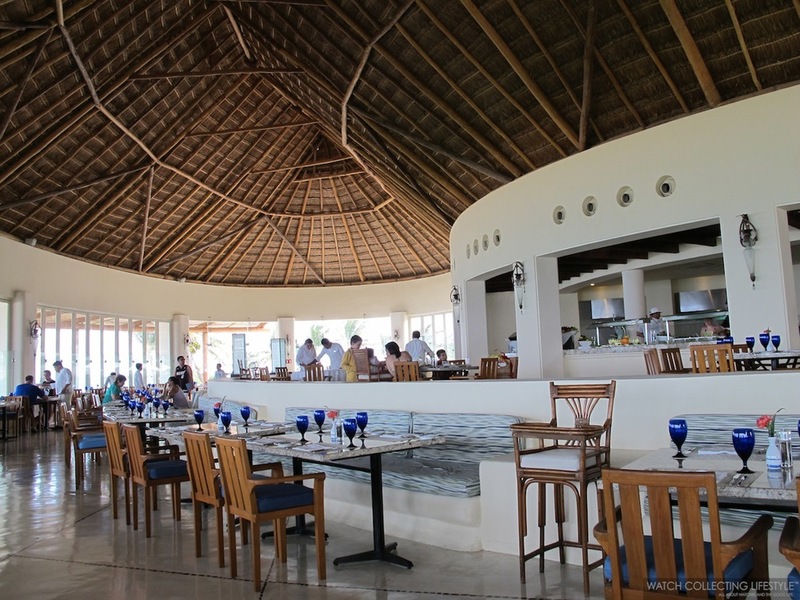 Arii Moana serves as the main dining restaurant at the resort and Tere Nui is your breakfast and lunch area. The Sunset Bar and Fare Hoa are your more casual, beachside places to eat and drink. Among them, the Sunset Bar is the place to be. With delicious sushi, Asian-inspired appetizers, the best views of Mount Otemanu, and an extensive wine and drink menu, one could hardly wait until 4:30 PM for it’s opening every evening. With a wonderful staff and seating that overlooks the water, order your favorite bottle of wine with dinner and take it back to the room if you want to enjoy a private nightcap in your bungalow. 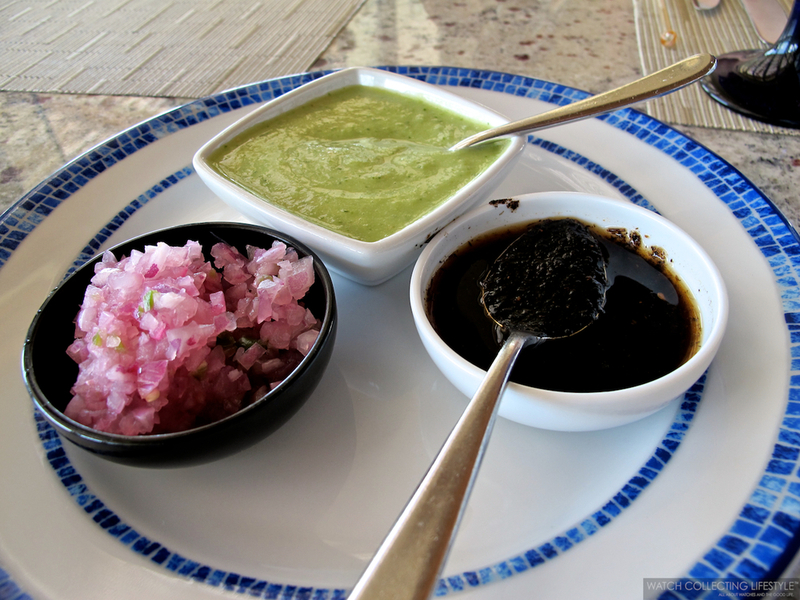 Two other more private options that should not be missed: in-bungalow dining and on-the-sand dining. When Room Service can prepare a three-course meal to be enjoyed in your bungalow, complete with linens, why not take advantage? Another option is to upgrade your experience with your loved one with a three-course private dinner for two on the sand. The Sunset Bar staff will make sure your drinks are always full as you watch the sun setting and the stars coming out to play. At the pool, you can lounge in many of the open cabanas. If you want to be in the sun, there are many lounge chairs that await you. The pool and Fare Hoa —the pool bar— are staffed with exceptionally friendly and helpful people who make sure you are never thirsty or hungry. If you find yourself hungry at Fare Hoa, be sure to try the “Poisson Cru”, a local favorite made from tuna that’s been marinated in lime juice and coconut milk. The flavor is extraordinary and is reminiscent of both Latin American ceviche and Hawaiian ahi poke. Let’s not forget that you also have the option of just hanging out on the beach in recliners as well. If the surroundings and beverages haven’t quite gotten you to a state of complete serenity yet, try the complimentary yoga. At 8:15 AM, overlooking one of the hotel’s lagoons, there is a 50-minute yoga class that you can enjoy. Just come in your comfy clothes and your AP as the mats, towels and bottles of water are all setup and ready for you when you arrive. Namaste. One activity that is not to be missed while in Bora Bora or anywhere else in Tahiti is snorkeling with sharks. Organized 'Shark and Ray Feeding' activities are all over the Society Islands and they offer an up-close and personal experience with Black Tip Reef Sharks and Lemon Sharks. 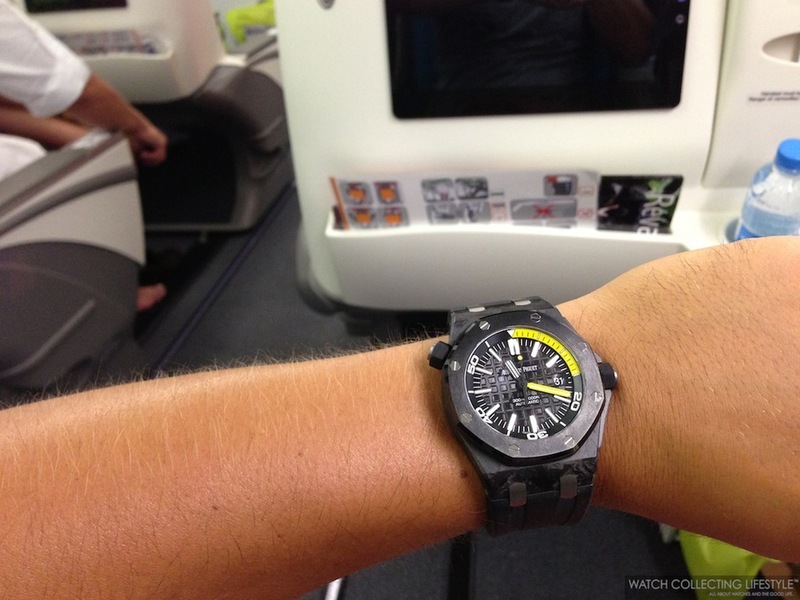 The Audemars Piguet Royal Oak Offshore Forged Carbon Diver on the wrist was up for the task. Now, we know for sure that if the watch had come in contact with the razor sharp teeth of the shark, its ceramic bezel would've surely prevented any potential damage to it. After being in the sun or enjoying a handful of water activities, be sure to hydrate after exiting the warm waters with an ice cold Hinano beer —the Tahitian favorite— or a sip of champagne in a coconut shell. If you’re a watchlifestyler who fancies an upgraded South Pacific experience away from civilization, look no further than spending your suspension from reality and life in Bora Bora. 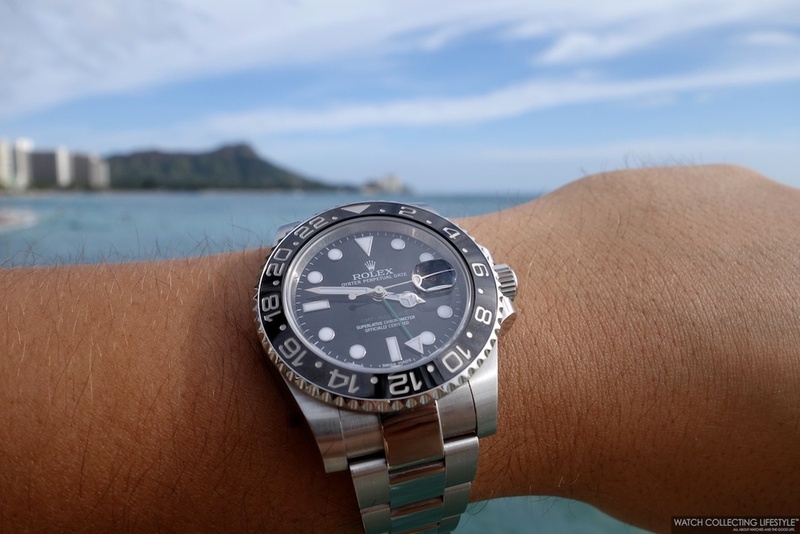 Although this particular watchlifestyler was sad to leave the Pearl of the Pacific, he knew very well that this wasn't going to be his last time in the magical paradise of Bora Bora. 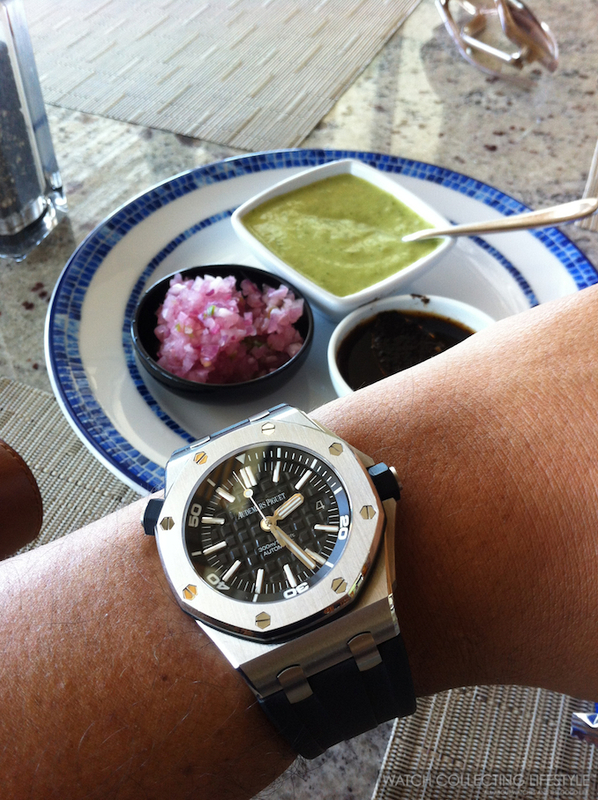 For more info on Audemars Piguet click here and for the Four Seasons Bora Bora here. 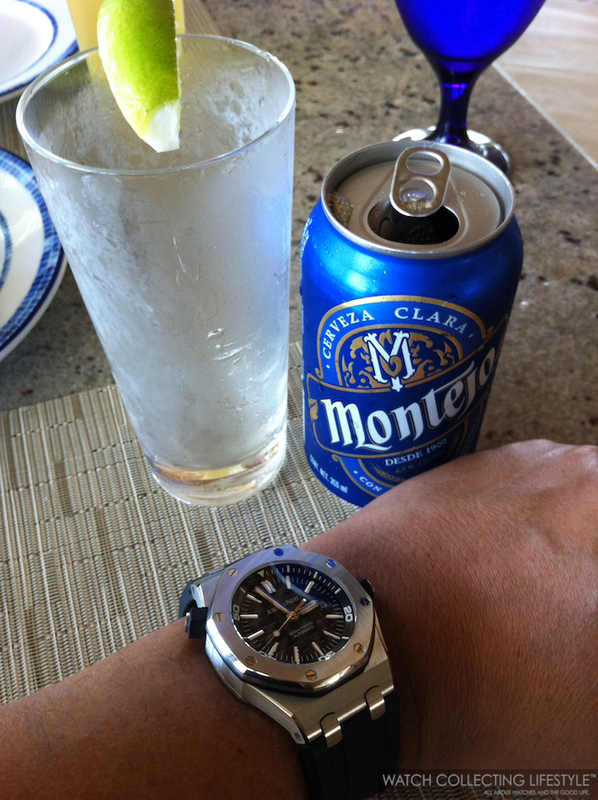 Posted on October 12, 2013 by Editor & Publisher and filed under Travel and tagged Audemars Piguet Royal Oak Offshore Forged Carbon Diver Four Seasons Bora Bora. For all of our beach loving watchlifestylers, we are featuring the luxurious Grand Velas Resort in Riviera Maya. Riviera Maya is a tourism paradise located in the eastern side of the Yucatan Peninsula in Mexico. This secluded beach destination is located between Puerto Morelos and Playa del Carmen in the state of Quintana Roo, Mexico. 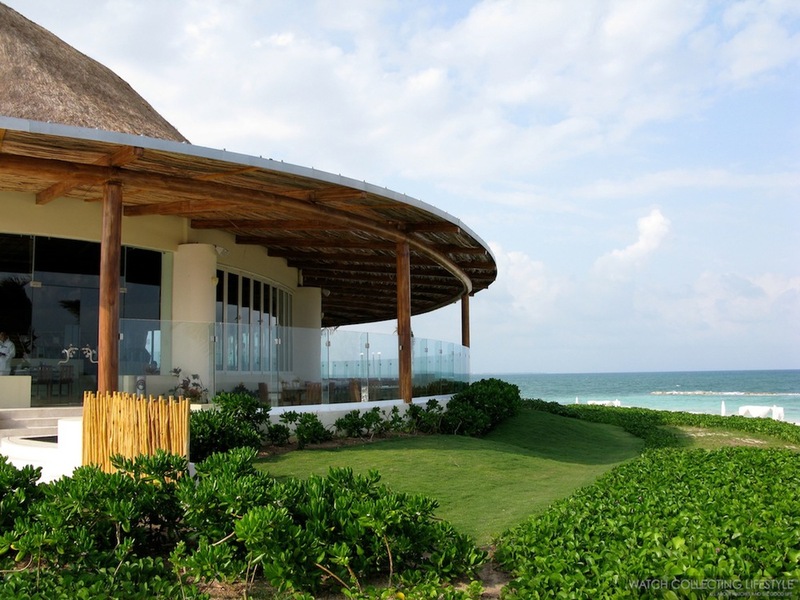 Grand Velas is only 25 miles south of Cancun and 5 miles away from Playa del Carmen. Grand Velas Riviera Maya opened in 2008 as the first and only luxurious all-inclusive resort in the area. We know what most of you think when we say 'all-inclusive'; however, it is actually nothing like what you might be imagining. This exclusive resort features five chef-inspired 'haute cuisine' restaurants and one buffet restaurant that can compete with any Michelin rated restaurant in the world. The names and specialties of the restaurants include Frida —gourmet Mexican—, Cocina de Autor —Spanish molecular gastronomy—, Piaf —traditional French—, Sen Lin —gourmet Asian fusion—, Lucca —Italian and Mediterranean— and Azul —international buffet that even includes sushi and sashimi. Grand Velas offers superb service, a tranquil beach without crowds and upscale guests from all over the world. If you are looking for a resort where the world and Mexican elite hang out, then this is the place. Once you drive in through its majestic doors, you will feel the serenity of 80 acres of protected mangroves. Upon arrival at the main hotel lobby for the Ambassador and Grand Class suites, you will be greeted by their friendly staff with hibiscus infused beverages and a nice cold face towel. The lobby features a modern super-sized 'Palapa' with beautiful decor and the comfiest couches where your check-in takes place. Upon check-in, you will be assigned a personal concierge to take care of all your needs during your stay, even if that includes purchasing some Vilebrequins in case you forgot to bring yours. Now, if you are looking for an even more relaxing experience at Grand Velas, you can book your suite within the Zen Grand suites area that is completely secluded and located in the heart of the mangroves. 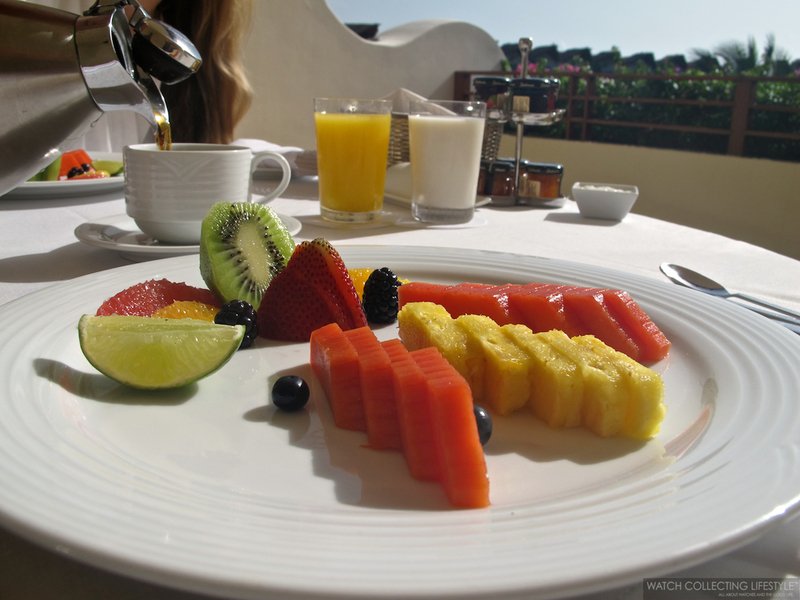 The downside is that you will be at least 10-minutes away from the beach and the majority of the restaurants. The upside, is that you are next to the world-class spa at this resort. There you can experience their amazing 'Water Journey' treatment as you go through different pools with different scents, waterfalls and even temperatures. At this exclusive resort, expect for the phrase 'your wish is my command' to become the norm. Whatever and whenever is the motto of their employees. 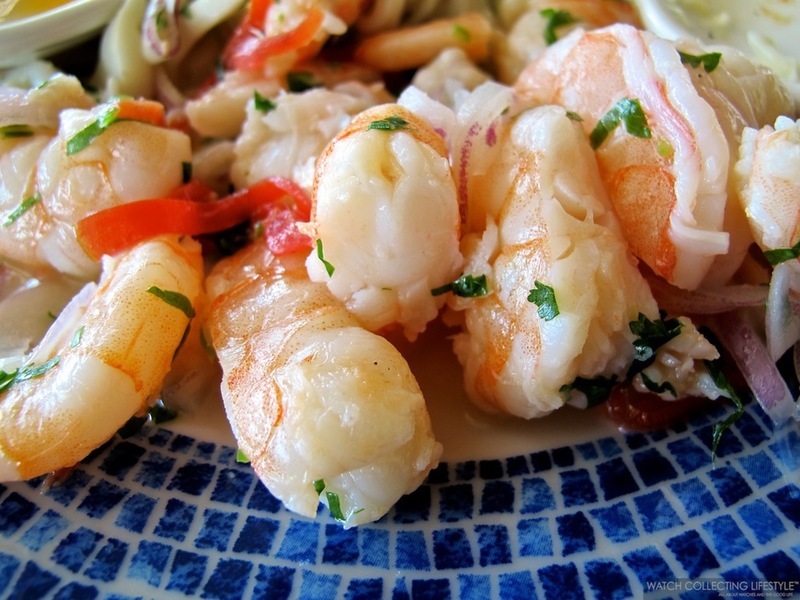 Ultra premium and premium liquors are included and some of the most fascinating Mexican seafood dishes like 'Aguachile de Camarón', 'Ceviche de Pescado' and 'Coctél de Pulpo' are at your disposition whenever you want a serving poolside. 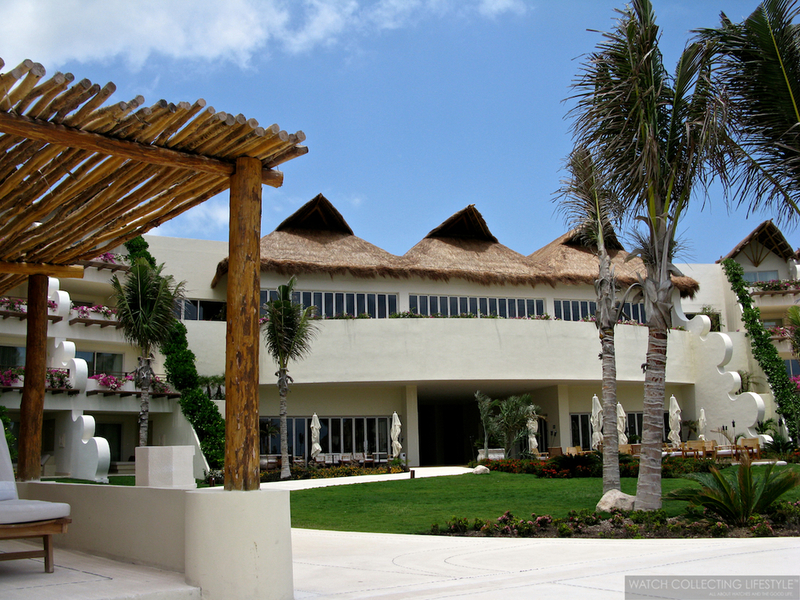 Regarding the accommodations, expect a very large suite with an ultra comfortable bed, Molton Brown amenities, fresh flowers, in-room all-inclusive dining service including breakfast on your terrace —make sure you order 'Huevos Rancheros' and 'Chilaquiles Verdes'— and even a bottle of Tequila to enjoy during your stay. What a perfect retreat! A full day by the beach includes a shallow waist high stretch of beach with serene warm waters, snorkeling opportunities just a few feet from your beach chair, a few visits to 'Azul' and some of the best prepared drinks you won't find at any other resort. By the way, the beaches are very private, somewhat secluded and with talc-like sand to pamper your feet. At night, after a full day of relaxation and indulgence by the beach, be prepared to savor the best international and Mexican cuisine in its different restaurants. 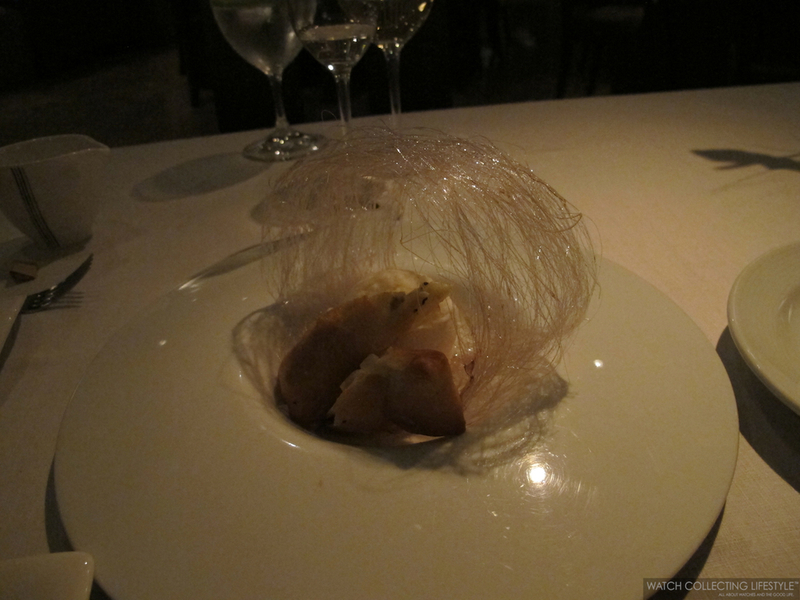 If you like places like Daniel, Le Bernardin, Jean-Georges, Le Cirque or Asiate, we promise you won't be disappointed by their food. After you've relaxed for a whole week at this fantastic place, rest assure you will not want to leave. At this resort you get world-class amenities with an amazing and personable service staff and some of the best dining experiences in this part of the world. Room rates start at approximately $700 USD per night in double occupancy. For more info click here. Posted on July 8, 2013 by Editor & Publisher and filed under Travel and tagged Grand Velas Riviera Maya Resort Riviera Maya Audemars Piguet Royal Oak Offshore Audemars Piguet Royal Oak Offshore Diver Yucatan Peninsula Playa del Carmen Cancun Montejo Beer Aguachile de Camaron Ceviche de Pescado Mariscos Punta Allen Puerto Morelos Vilebrequin Swimwear Vilebrequins. IWC Ingenieur Mission Earth: Los Cabos Arch in Baja California Sur, Mexico. Land's End. This time we are reporting from south of the border down in the picturesque Baja California peninsula. San José del Cabo and Cabo San Lucas a.k.a. Los Cabos are located in the southernmost part of this peninsula, right where the Sea of Cortez converges with the Pacific Ocean. As we embarked on a Bruce Roberts Norfolk 43' sailboat in the company of our IWC Ingenieur Mission Earth, we knew an unforgettable afternoon was about to begin. Just a short sail from the marina is the distinctive landmark of Cabo San Lucas; the rugged taffy-colored Arch—a rock formation that erupts from the sea and is also known as Land's End. A visit to Land's End is undoubtedly one of the most popular things to do. By the way, it’s called Land’s End because if you followed a straight line south from it, you would not touch land again until you reached the South Pole. The IWC Ingenieur Mission Earth is a rugged timepiece designed for those that are in constant contact with nature and eager to discover all that earth has to offer. As we sailed out of the marina, we passed Lover's Beach —the perfect beach that only appears during low tide next to the Arch— and a big group of sea lions catching the sun on the rocks right next to it. The Arch marks the point where the the Sea of Cortez meets the Pacific Ocean in the Gulf of California. Fortunately, we had good wind and 20 minutes into our journey, we were already admiring the beauty of the Arch surrounded by sea lions, pelicans and seagulls. In the distance, a Catamaran navigated the Pacific Ocean, while we were still navigating the Sea of Cortez. As we headed to the side where the Pacific Ocean begins, we saw a few whales in the distance heading north after breeding and feeding in these magnificent waters. After another hour or so at sea and on our way back to the marina, we were fortunate to be in the presence of one of life's best spectacles: a beautiful sunset that turned the skies all hues of pink, orange and red, just like the red accents on the beautiful dial of our IWC Ingenieur Mission Earth. Sticker price $7,300. For more info on this watch click here. Posted on May 28, 2013 by Editor & Publisher and filed under Travel and tagged IWC Ingenieur Mission Earth Los Cabos Cabo San Lucas Mexico Arco Cabo San Lucas Baja California Sur Land's End Sea of Cortez Cabo San Lucas Bruce Roberts Norfolk 43' IWC Ingenieur Mission Earth ref. IW323601. Baselworld: A Typical Day in Pictures. Commuting From Zürich to Basel. These pictures will show you what our typical day attending Baselworld looked like. Since we were staying at the fabulous Park Hyatt Hotel in Zürich, we had to commute to Basel everyday. We did this daily for almost a whole week. Now, it's your turn to experience the journey and pretend you were there with us. Getting ready to leave our hotel on Press Day, April 24th, 2013. Our companion for the day. Discontinued Audemars Piguet Royal Oak ref. 15300 with blue dial. Taking the ZVV Tram at the Stockerstrasse stop. Street view on Banhofstrasse and Paradeplatz from the tram. Heading to the Banhofplatz to take our train to Basel. Watch stores on the way to the train station on Banhofstrasse. Türler, one of the biggest authorized watch dealers in Switzerland. Checking the timetable for the next train to Basel. 14:34 Departure. We are right on time. One of the famous Mondaine clocks at the train station. All train stations in Switzerland are stocked with Mondaine clocks. Time for some caffeine. We are slightly jet lagged but excited about Baselworld. Segafredo, one of our favorite coffees. We have boarded our train and getting ready to leave. We will be in Basel in 51 minutes. The Swiss landscapes. Relaxing and comforting. We have arrived at Basel's train station. Audemars Piguet Royal Oak ref. 15300. Time check, 15:30. Basel's train station. We were greeted by a Hamilton small airplane hanging from the roof, heavy watch advertising and the blue colors of Baselworld. Time to get on the tram to the Messeplatz/Exhibition Square. We are 10 minutes away. The street view from the tram. We are one stop away. We have arrived at our destination. Baselworld 2013, here we come. The entrance. Quite empty as it is Press day. The next day was very crowded as expected. Posted on May 2, 2013 by Editor & Publisher and filed under Baselworld, Travel and tagged Baselworld 2013 Audemars Piguet Royal Oak Zürich Basel Switzerland Banhofstrasse Park Hyatt Zürich. Visiting: Mies van der Rohe Pavilion Barcelona. A Living Dream For Modernists. Also known as the Barcelona Pavilion, this modern landmark was designed by German architect Ludwig Mies van der Rohe to function as the German representation during the 1929 Universal Exhibition in Barcelona, Spain. This pavilion is one of the most important examples of modern architecture worldwide. Completely built over a plinth of travertine, Mies utilized chrome-clad columns to give the impression of a hovering roof. Tinos-marble, Vert-Antique marble, onyx doré and tinted glass—gray, green, white and traslucent— perform as precious spatial dividers within the pavilion. The same features of minimalism and spectacular design where applied to the furniture specifically designed for the building, giving birth to the iconic Barcelona chair. The white leather and chrome chairs are placed over a black carpet right at the entrance of the building, leading the visitor into a small outdoor court with a small pool and a over-life-size sculpture named 'Der Morgen'—the morning— by sculptor Georg Kolbe. The bronze sculpture portrays a woman rising from the water and gesturing to the rising sun. 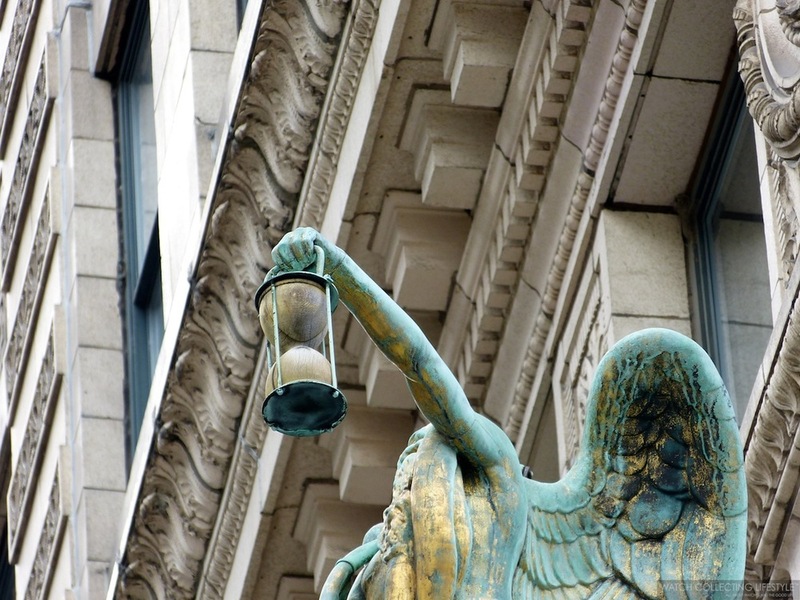 One can also leave the building by walking down the long side of the back of the building and away from the statue. This 'free plan' building includes a large water basin at the front that stretches towards the main entrance creating the impression that the water's surface continues under the plinth connecting the exterior with the interior. This is the earliest example of what we know today as infinity pools. Visiting the Barcelona pavilion is truly going back in time and experiencing why design is so important from a watch collecting standpoint. Our Sea-Dweller, an iconic Rolex reference can confirm the importance of design. Posted on April 11, 2013 by Editor & Publisher and filed under Travel and tagged Mies van der Rohe Barcelona Rolex Sea-Dweller Modernism Mies Pavilion. 50th Anniversary Rolex Submariner: The Maldives. Enchanted Paradise. Back in 2003 in order to commemorate the 50th anniversary of the Submariner, Rolex launched the ref. 16610LV with its unmistakeable green bezel and maxi dial with larger luminous markers and thicker hands. This beautiful watch is no longer produced by Rolex and has become an iconic piece within the long history of the Submariner. The Maldives, officially the Republic of the Maldives and also referred to as the Maldive Islands, is an island nation located in the Indian Ocean. Consisting of a double chain of 26 atolls is one of the greatest destinations for beach travelers. About 700 kilometers southwest of Sri Lanka and 400 kilometers southwest of India you can find the Coco Budu Hithi resort where watch lifestyler Ham went on his honeymoon. 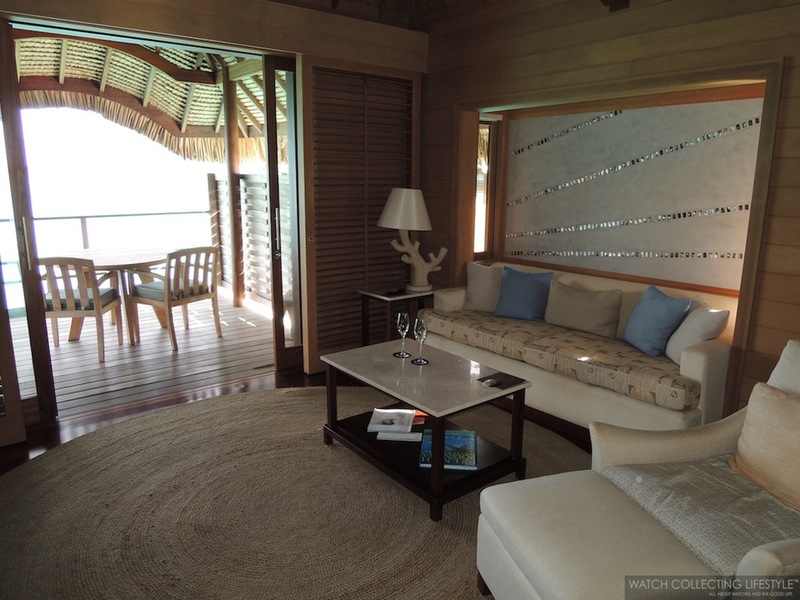 At $1900 a night the Coco Budu Hithi resort can guarantee you will have the trip of a lifetime. A destination where the only limit is your imagination, discover tailor-made experiences that will inspire you. Without a doubt the Rolex Submariner 50th Anniversary is the perfect companion for a beach trip. Whether you are a serious diver or you just enjoy snorkeling in the shallow waters, there's one thing you can be pretty sure about, your Rolex Sub will stay dry inside as its movement is securely protected with its hermetic oyster case to a depth of up to 300m/1000ft. As you can see by the pictures this place is just a fantastic oasis. The views, the service, the accommodations and the experience are just as posh as it gets. Not to mention that during our friend's trip they had the opportunity to see a beautiful sea turtle while swimming right outside of their bungalow. 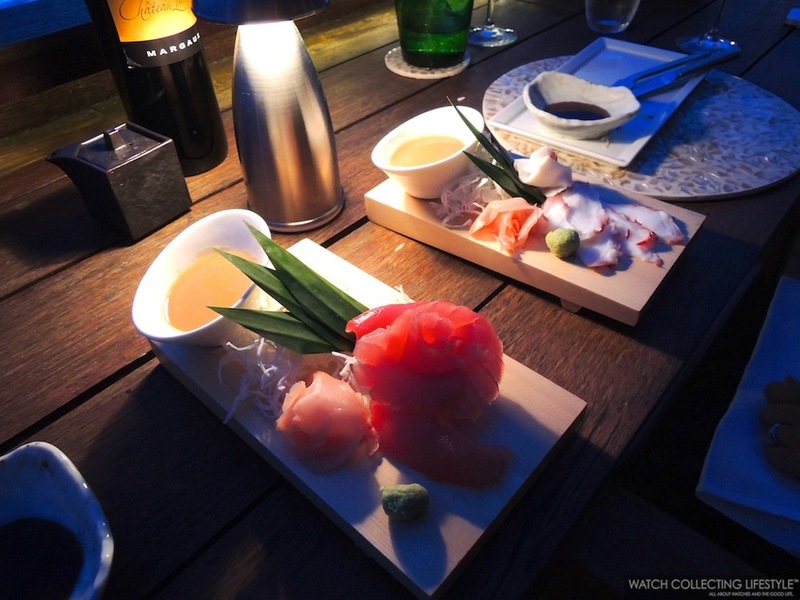 Additionally, while in the Maldives rest assure that food will be spectacular and if you are a sushi lover, you will enjoy one of the best sashimis you've ever had and almost as good as if you had been in the middle of Ginza in Tokyo. Posted on April 2, 2013 by Editor & Publisher and filed under Travel and tagged The Maldives Budu Hithi 50th Anniversary Submariner Coco Budu Hithi Rolex ref. 16610LV.